Sixteen eager students were ready to start a day of learning and practising calligraphy as part of the events associated with the fantastic Anglo-Saxon Kingdoms 2018-2019 exhibition at the British Library. 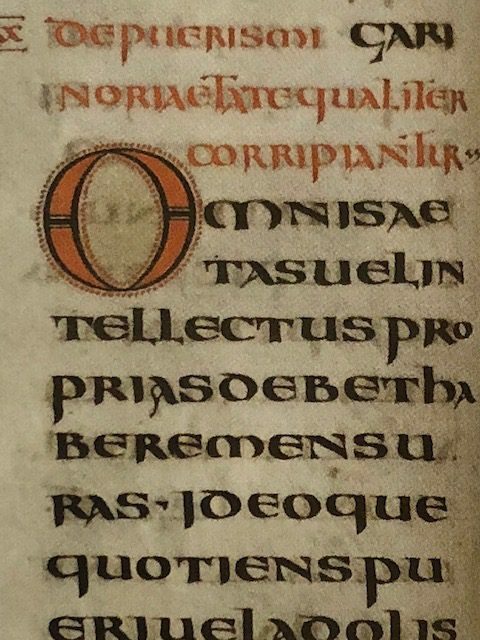 We were focusing on the Angled-Pen Uncials as in the St Cuthbert Gospel of St John, a very pleasing writing style, and which has only majuscules, or capital letters. 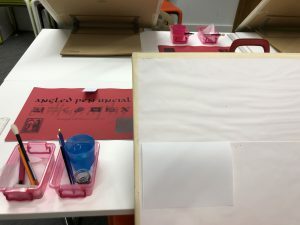 Everything was set out before the students arrived with a sloping board, pen and nib, ink, etc and sets of A3 information and exemplar sheets so that no ruling lines was necessary while learning. 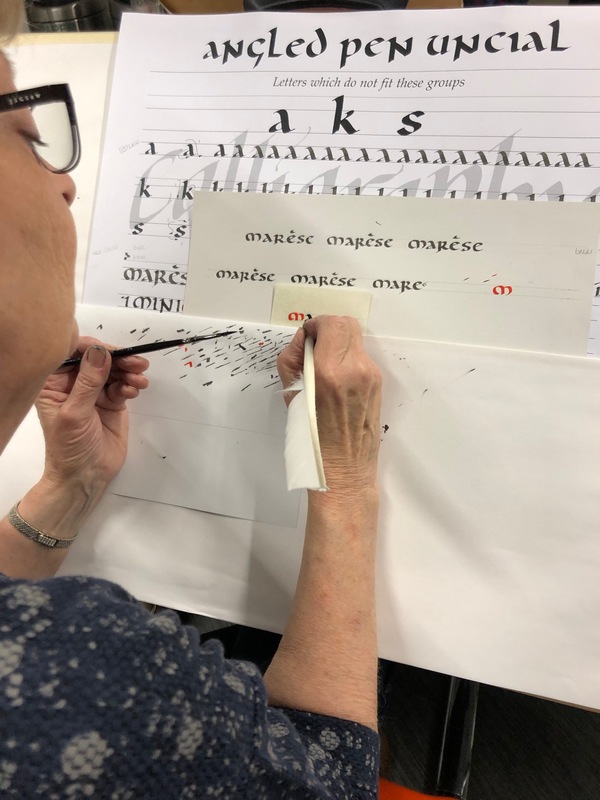 The morning was spent learning and practising the letters and then the afternoon focused on quill cutting and preparing and writing on vellum. 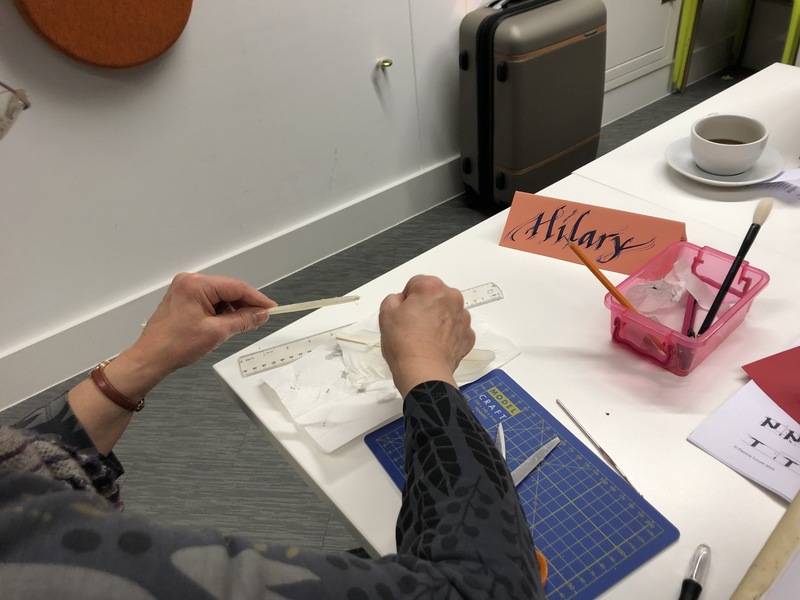 Cutting quills was a lot tougher than it looked – the barrels of swans’ feather are really strong! It does take some preparation, but once the steps are clearly explained and reinforced to everyone as they cut the feathers, really good quills resulted. 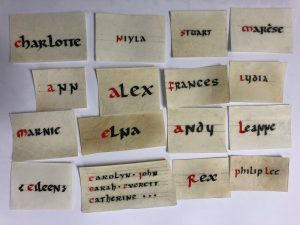 Then it was on to preparing the vellum, practising writing names using the quill and then, with a deep breath, writing on the vellum itself. 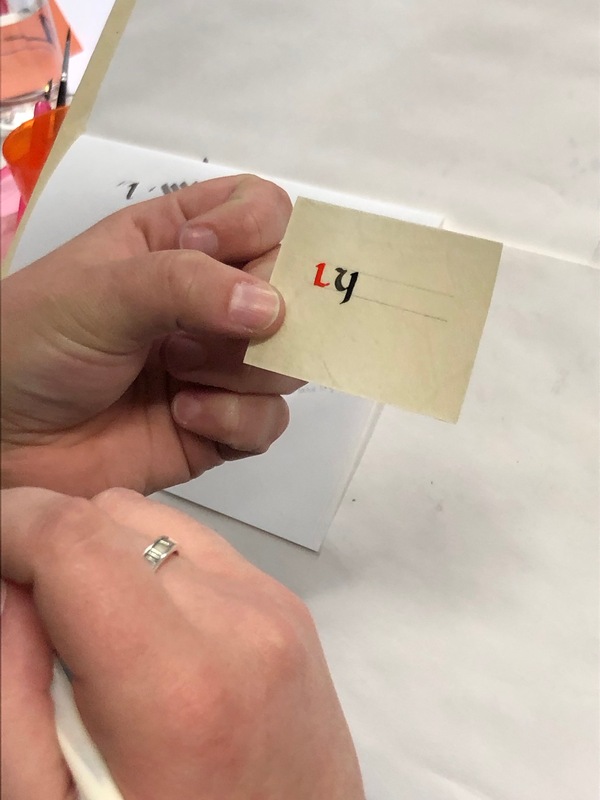 I suggested using Schmincke Calligraphy Gouache in vermilion as a contrast for the initial letter and this worked really well. The results needed to be admired even halfway through the writing! And the concentration here was intense! But the results were very much worthwhile! Congratulations to all students for such a successful day – and for being such a lovely group to worth with. 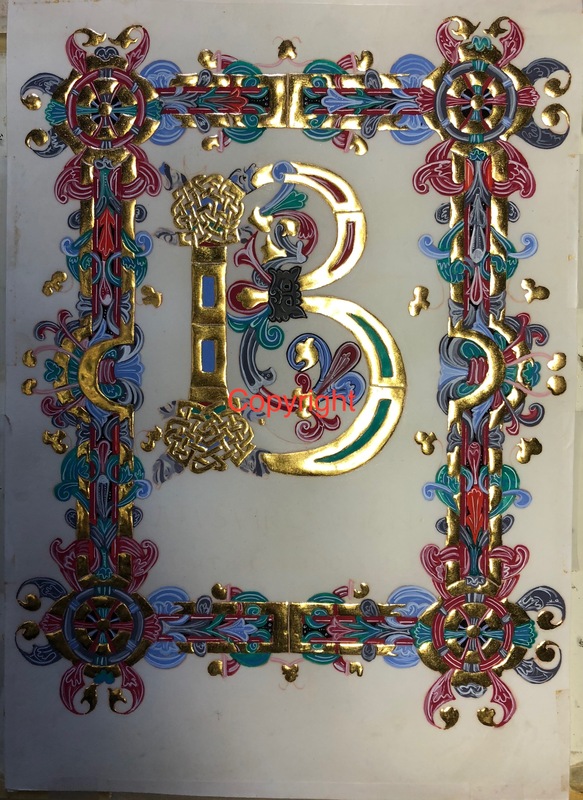 This entry was posted in Blog, Calligraphy and lettering and tagged British Library, calligraphy, quills, quills from feathers, treating vellum, vellum on 14 February 2019 by Patricia. 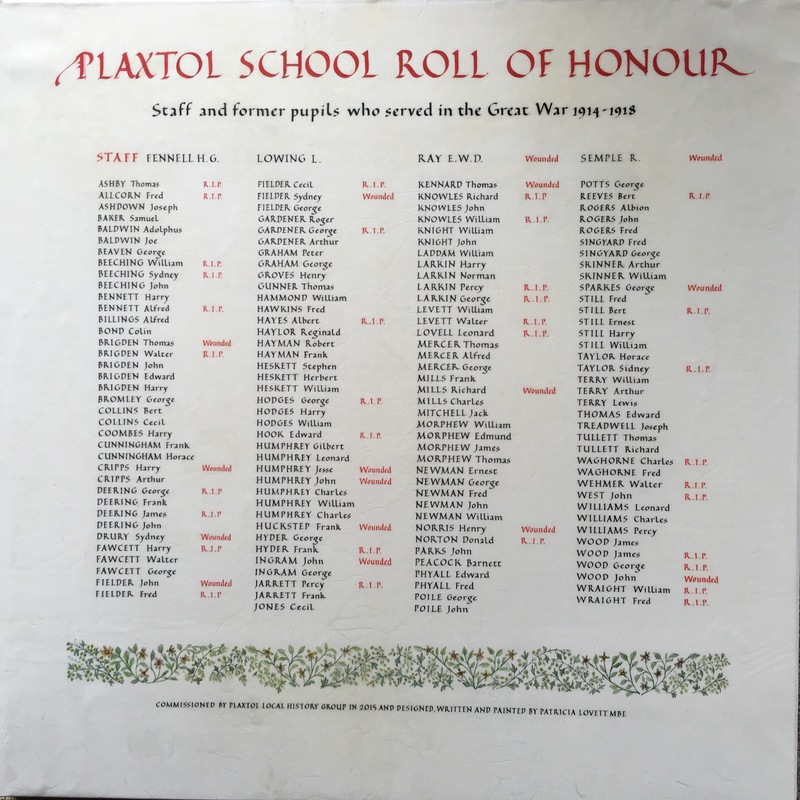 The vast number of people involved in the First World War is being highlighted during these centenary years. This huge number is perhaps particularly exemplified in the small Kentish village of Plaxtol. 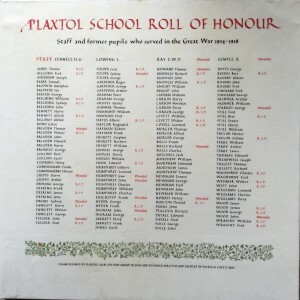 Over 150 men, all former pupils of the local village school, went to the front, as well as four members of staff. 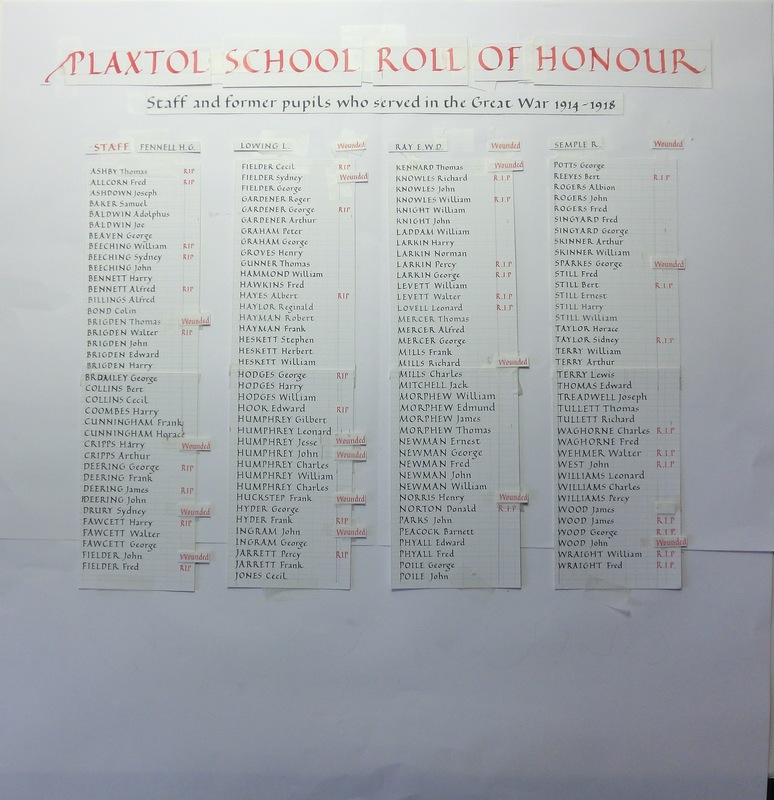 I was asked recently to prepare a Roll of Honour on vellum recording the names of these men. I was given a typed list and the requirement that there would be a decorated border of cob nuts and hops, as these were local to the area, and so set about designing the panel. I experimented with the styles and sizes of text, spacing between the lines, placing of the blocks of text and so on. 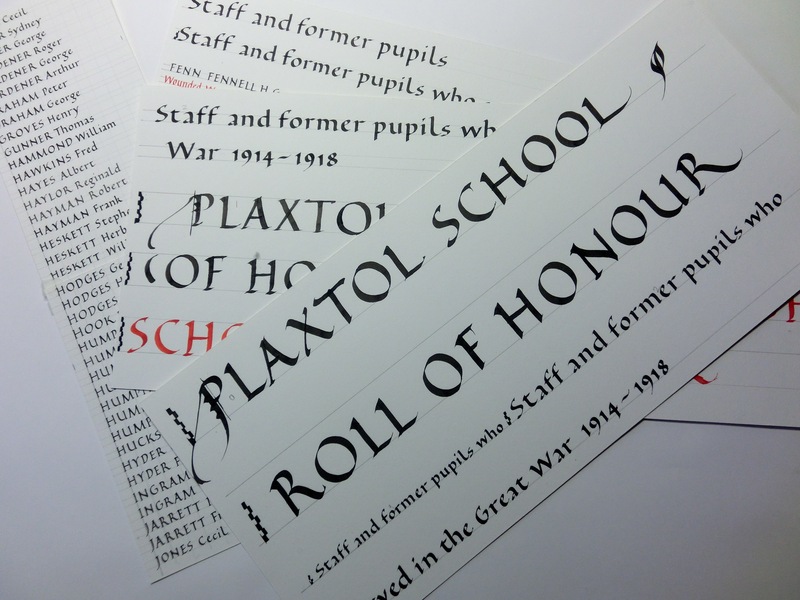 I decided on Edward Johnston’s Foundational Hand for the text, as it was this style, and Roman Capitals, again championed by Johnston, that MacDonald (Max) Gill used as his lettering design for all the First World War Memorials; Max being a student of Johnston. As always, everything was written out in rough first, and then positioned where it was to go. 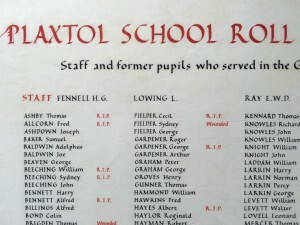 In the typewritten version the letters ‘RIP’ were written without fullstops, which I copied for two of the columns, and then inserted the fullstops for the other two – we all agreed that the latter looked better. I also used the traditional colour scheme for such panels of red and black. 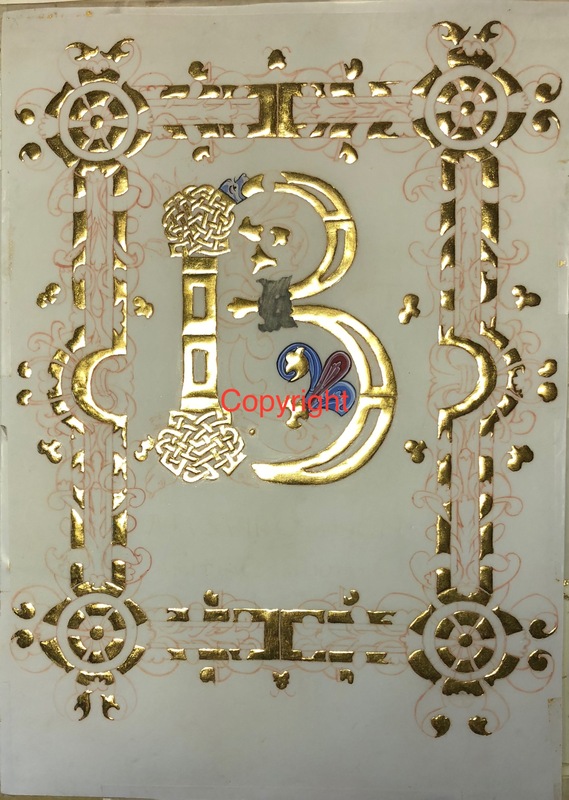 Then it was deep breath time, the vellum was prepared, ruling up done, and I had to start the writing. 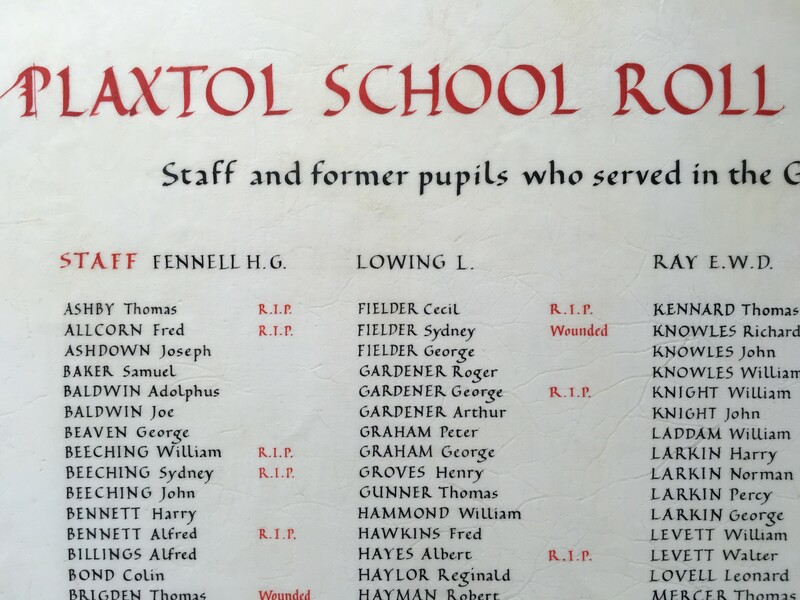 I tacked the four columns of names first to get the body of the panel done, writing all the names and then returning with the same size nib and red paint to insert the words ‘Wounded’, or ‘R.I.P’ where appropriate. 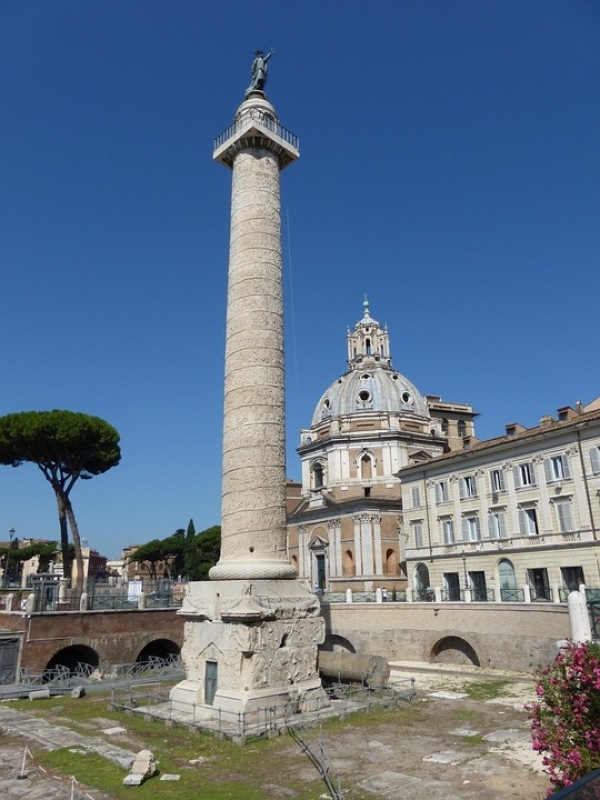 However, I used a compressed Roman form for ‘Wounded’ so that the columns weren’t too wide. I left painting the border until last. 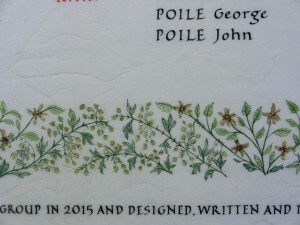 My original design had the hops and cob nuts entwined but this was not was wanted. 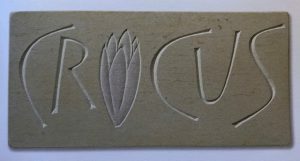 The suggestion of having separate blocks of the two plants would have made this part of the panel very disjointed, so I drew a long wavy line along the whole border, with the cob nuts growing up from the ‘valley’ and the hops hanging down from the ‘hills’. 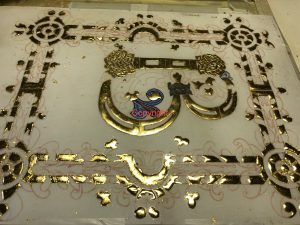 The width of border was about an inch (2–3 cm) high. The hops are about 1–2 mm each in size and each have about 5 different colours on them. 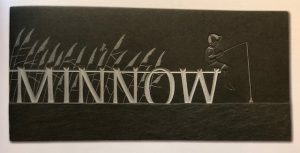 The panel was too large for me to stretch the vellum first around a board as I couldn’t then reach the top of it, so I had to do this after it was all done. The need for stretching is obvious from the way in which the skin is bumpy in the picture on the right. 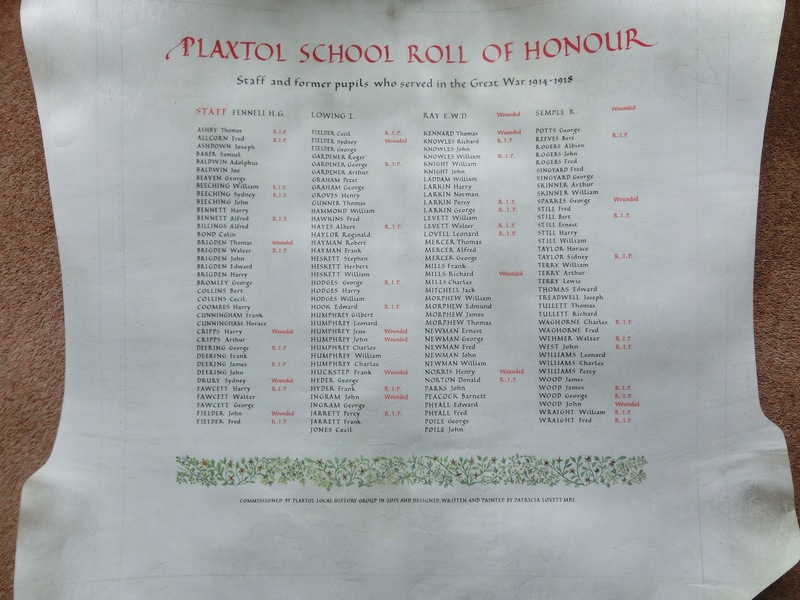 It was a huge job and difficult to cost at the beginning – I spent far more time on it than I charged for, and now it hangs in Plaxtol Village Memorial Hall. It would be nice if more people knew about it and were able to see it. 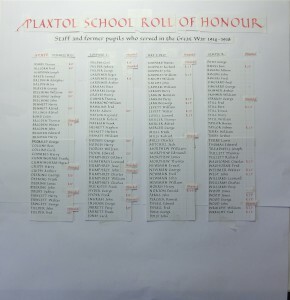 This entry was posted in Blog, Calligraphy and lettering, Calligraphy techniques, Interesting stuff and tagged decorated border, First World War, Kent, Plaxtol, Roll of Honour, vellum, WW1, WWI on 9 January 2019 by Patricia. It really was a great joy and privilege to be part of the great Polonsky Project, which was a joint venture between the British Library and the Bibliotèque nationale in Paris to digitise manuscripts which from before the year 1100. 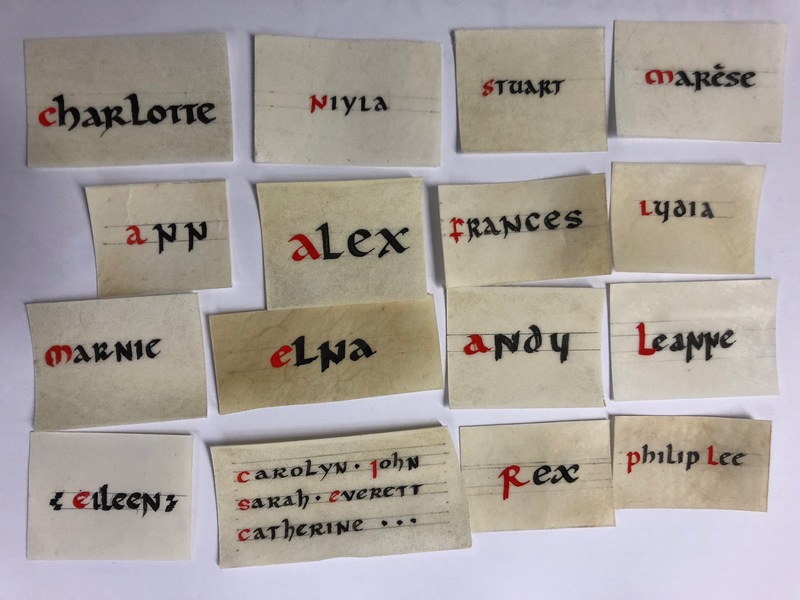 They were keen to show how those manuscripts were made, and so it was on two very hot days in the summer of 2017 that Dr Alison Ray, filmer Jan and I spent many hours recording those processes. 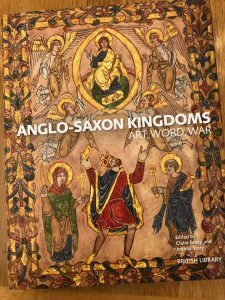 The films are now on the British Library’s and the Bibliotèque nationale’s websites (the latter being dubbed into French) and sections of the films were also used in the fantastic 2017–2018 Anglo-Saxon Kingdoms exhibition at the British Library. 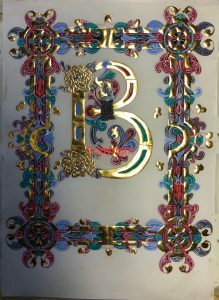 The first film features the pen used for the writing, which, of course, was usually a quill cut from the feather of a large bird. 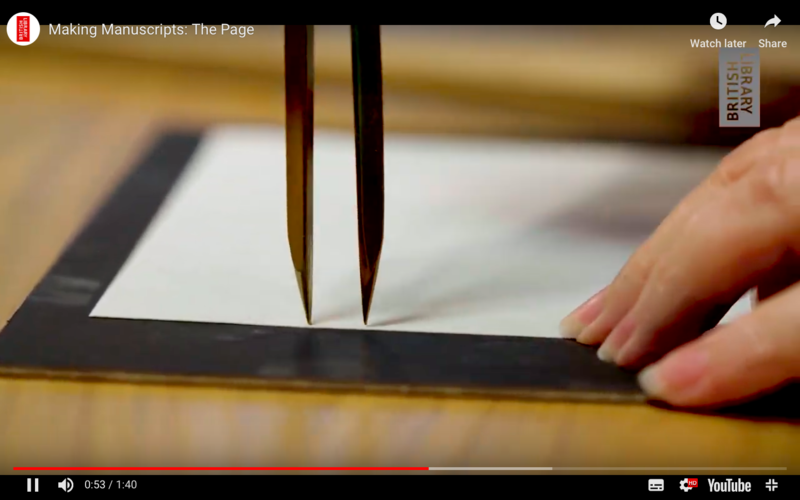 I always use penknives which have curved blades as the curve rolls over the slight curve in the barrel of a feather to cut the nib tip, whereas a straight blade tends to squash the feather. Indeed, penknives today (the clue is in the name!) still always have a curved blade. Here’s the link. 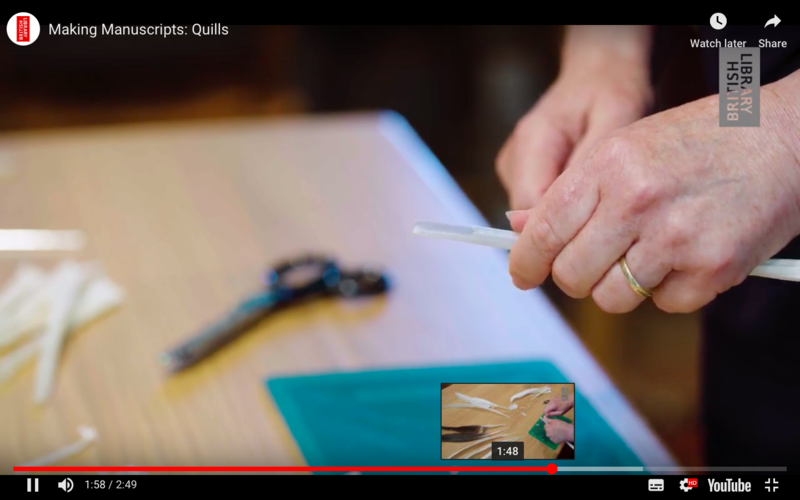 There’s more on quill knives and how to cut a quill on my website on this link. 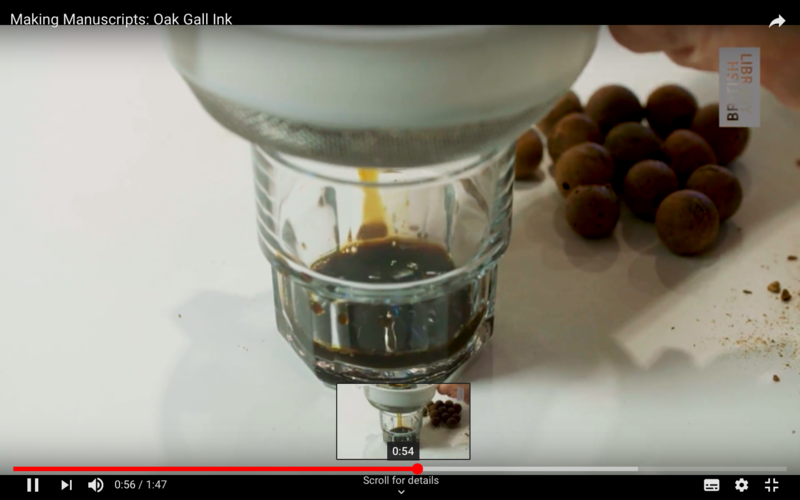 Ink was usually made from oak galls, although in fact peach, cherry and apricot stones can also be used but give a less dense colour. It’s the tannic acid from the galls reacting to copperas (iron sulphate) that creates a dark liquid, and which needs an adhesive, in this case gum Arabic, to ensure that it adheres to the writing surface. 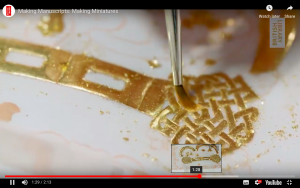 To see the process, click here. The writing surface was vellum or parchment – calfskin, sheepskin, goatskin or ever deer on occasion. 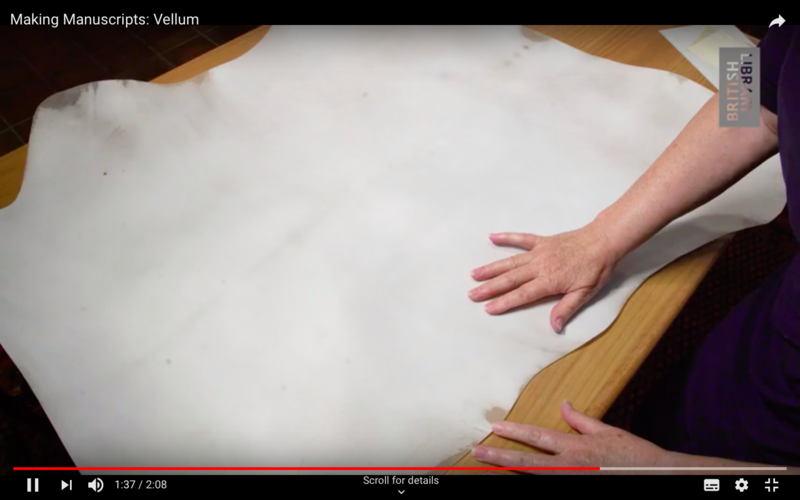 In this clip I explain about the differences between the hair and flesh sides of vellum and also the qualities of other types of skin. More here. Having cut pieces of skin to size for writing, the page needed to be set out, and often dividers – similar to sets of compasses, but with a point at the end of each leg – were used as it was easier to mark the exact positions of the guidelines in this way. 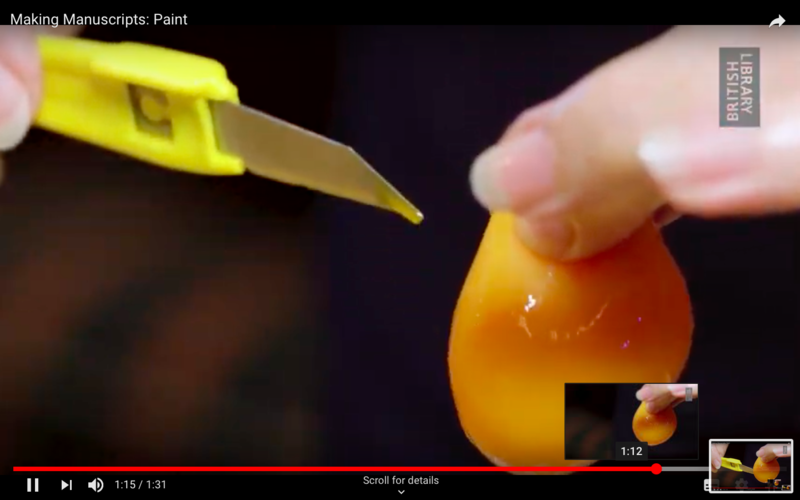 On occasion, the lines would be set out using a ruler and lead point (or similar) and then the positions marked using the tip of a knife (perhaps a penknife). 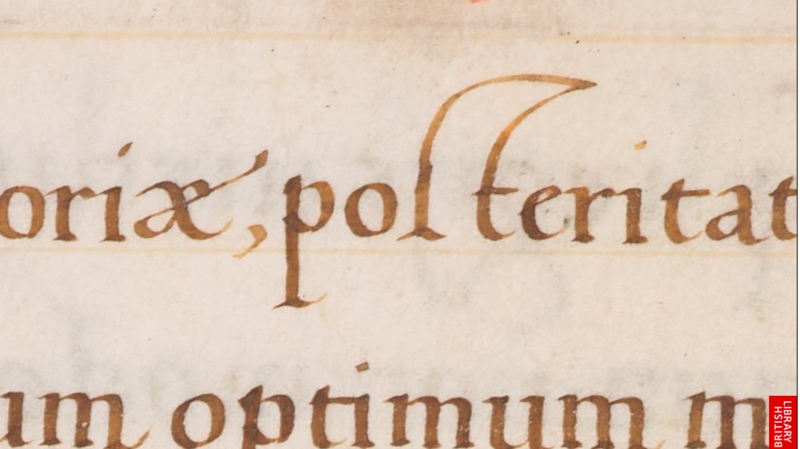 Here the ‘point’ would actually be a triangle shape and this can be seen in some manuscripts. 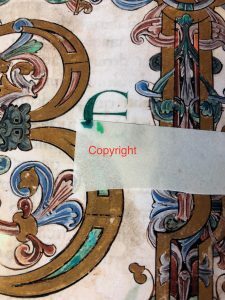 There’s more on setting out a manuscript page here. Pigments used in illuminations came from animal, vegetable and mineral sources. 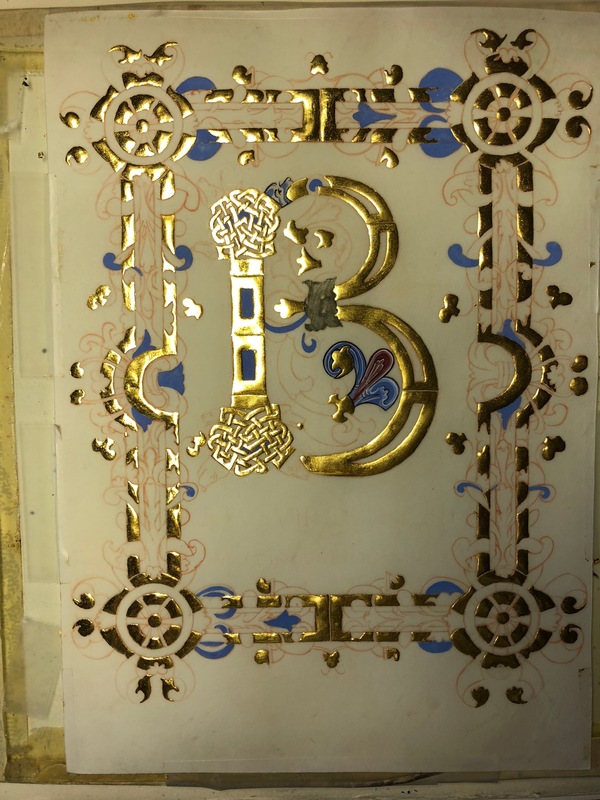 Perhaps the most famous is ultramarine, as Cennini Cennino called it ‘perfect, beyond all other colours’. A very similar blue, but much cheaper was citramarine. Woad and indigo are from vegetable sources along with madder. And Tyrian purple and carmine came from animals. 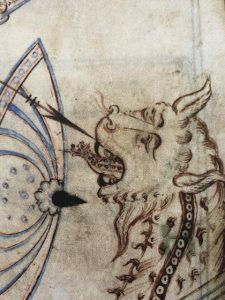 There’s more on this link, including dragon’s blood! 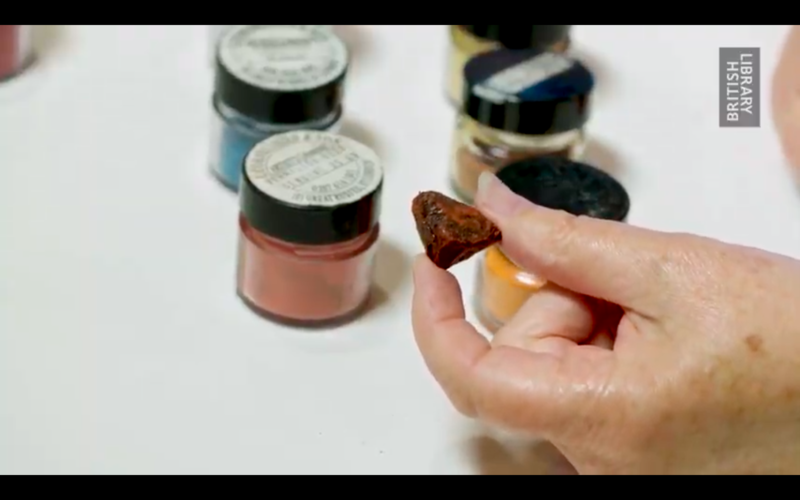 These pigments have no natural adhesive (apart from saffron interestingly!) and so this needs to be added. Traditional either glair, the egg white or the egg yolk was added. This film clip explains the process, including the equivalent of a hole in one! It can be tricky removing the egg yolk from the egg sac, but when this was being filmed, it worked with the very first egg! Here it is with the knife being withdrawn and the yolk falling out at the bottom. See the whole thing and more here. 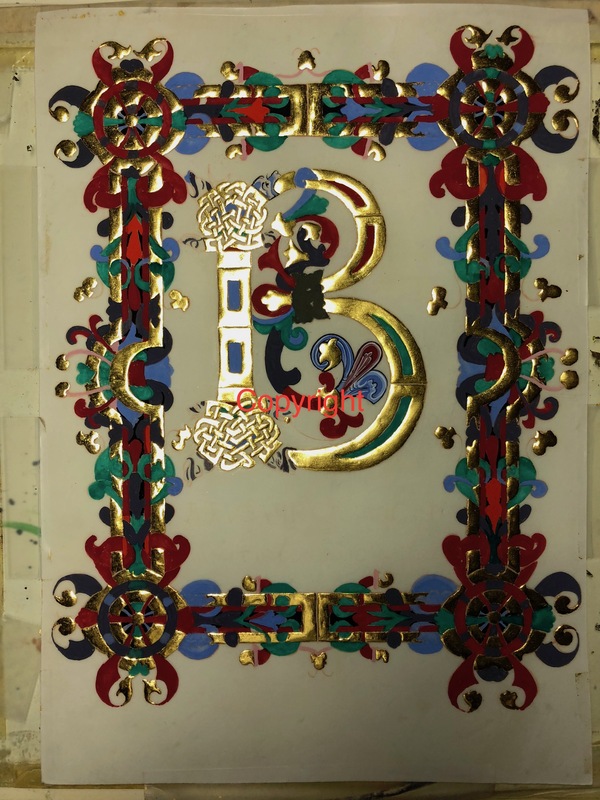 And having got everything ready, it was then only the setting out the illumination, laying the gesso, applying gold and then painting bringing everything to life and with wonderful colour. Watch the process here. It is hoped that these short films will add to the knowledge and understanding of these historical craft processes and ensure that more people understand and appreciate the skills that went in to creating the wonderful manuscripts now in great collections such as those at the British Library and the Bibliotèque nationale. 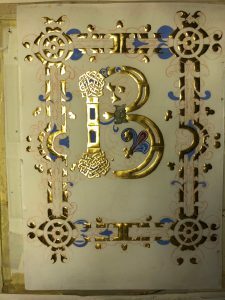 This entry was posted in Blog, Calligraphy and lettering, Calligraphy techniques, Interesting stuff, Manuscripts and tagged British Library, cutting quills, feathers, gesso, gold, how manuscripts were made, illumination, ink, leaf gold, making medieavl manuscripts, medieval manuscripts, oak gall ink, parchment, pigments, Polonsky Project, quills, vellum on 17 December 2018 by Patricia. The Queen Elizabeth Scholarship Trust (QEST) was set up by the Royal Warrant Holders Association nearly thirty years ago. QEST awards funding for its scholarships and apprenticeships in a whole variety of crafts. 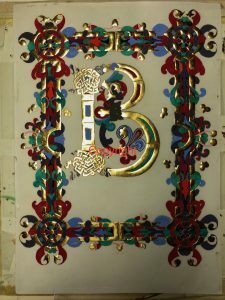 This range is shown in this splendid new book on British Craftsmanship. 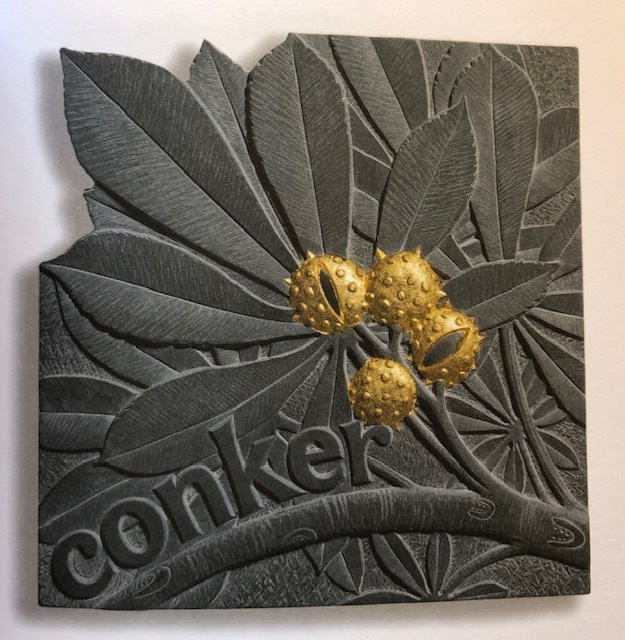 It is a huge book – almost coffee table size in itself – and contains a series of stunning photographs taken by Julian Calder, who has managed to capture each maker, with text by Karen Bennett. 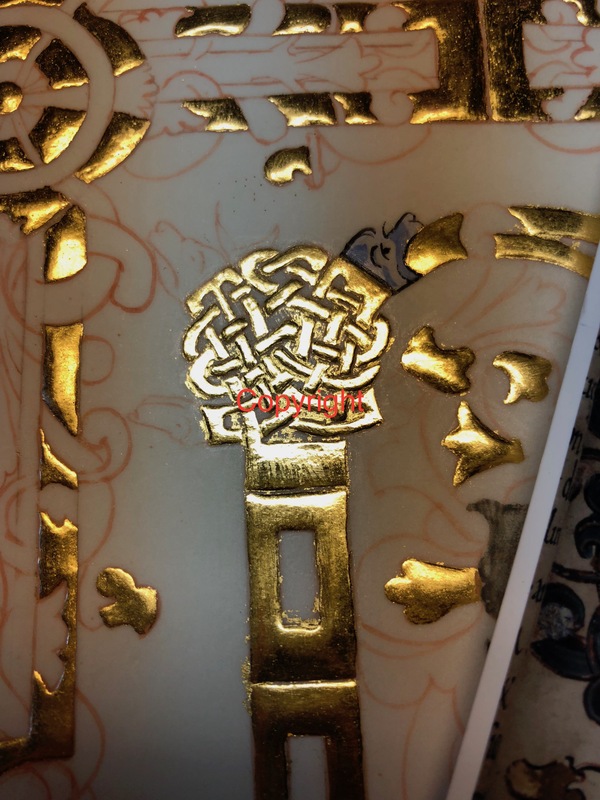 Each of a selection of scholars and apprentices is featured on an opening spread. 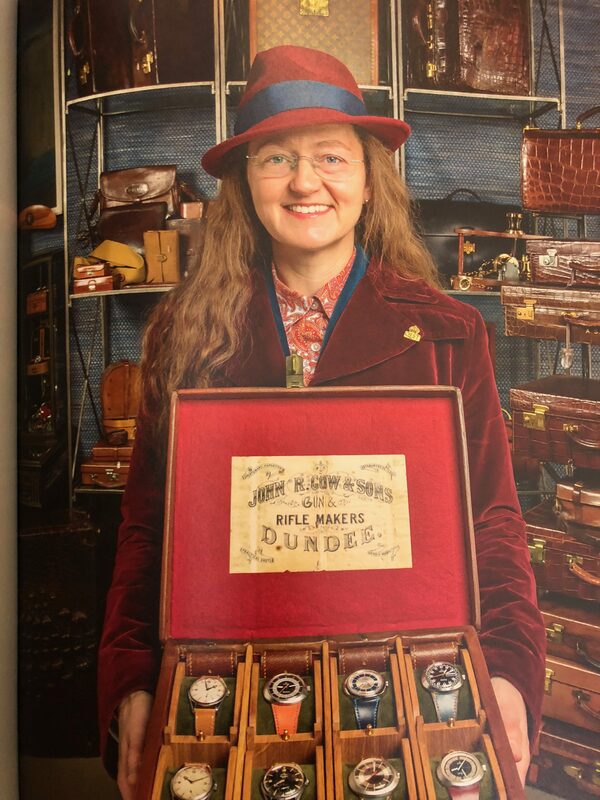 Mia Sable shown here is a saddler and leather designer. Having a varied career, including time at Canary Wharf, Mia started to learn saddlery at Capel Manor, by chance at three days’ notice! 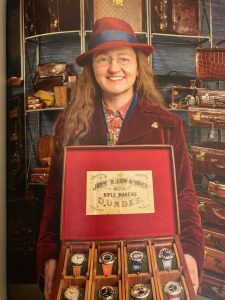 With saddlery skills tucked under her belt, Mia diversified into watch straps and bespoke watch straps now form her main business.She says ‘It is satisfying to make things that could last for a generation’. 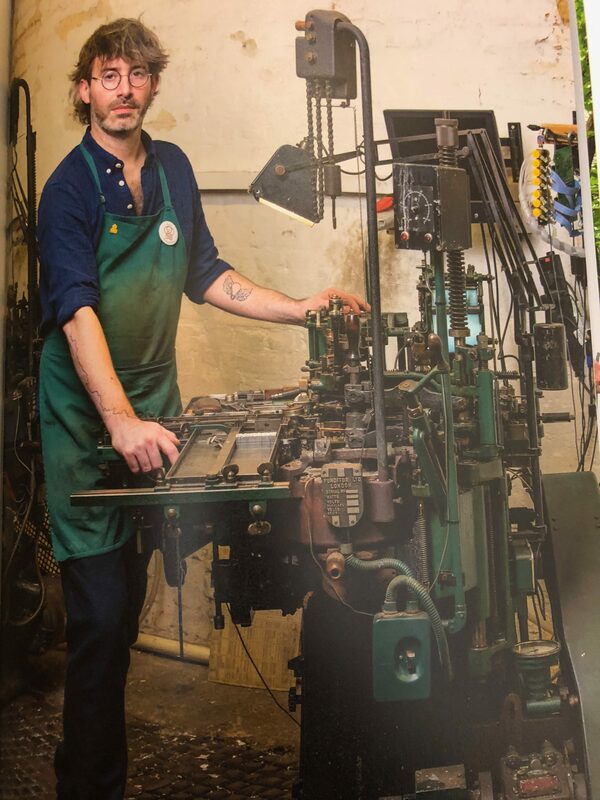 Nick Gill was a musician when he bought a second-hand press to produce the sleeves for CDs. He had two weeks’ experience with Phil Able at Hand & Eye Letterpress, and gained more experience when he returned to help on a large job. More equipment, more type, more tuition all increased Nick’s proficiency, experience and skill. He travelled to the US in the meantime to further his knowledge. 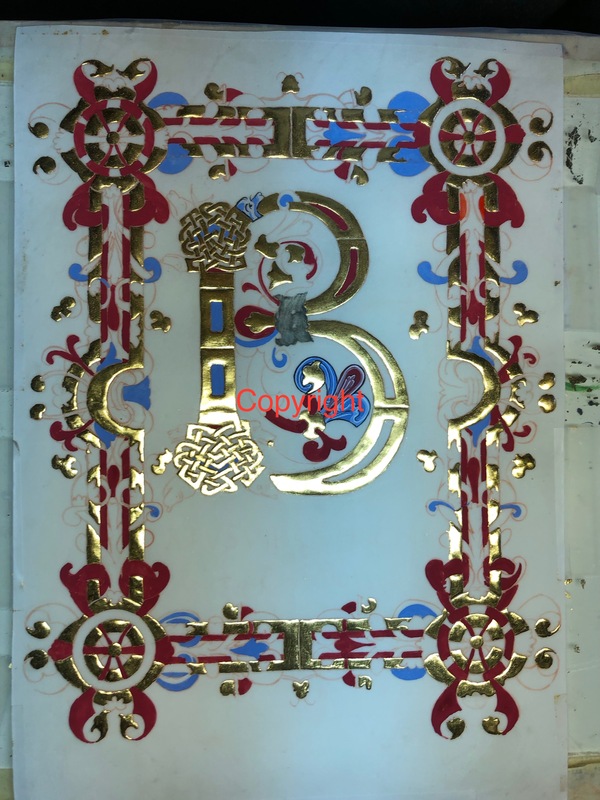 Now working in Yorkshire, Nick also casts and sells metal type as well as printing. And he is still a musician. 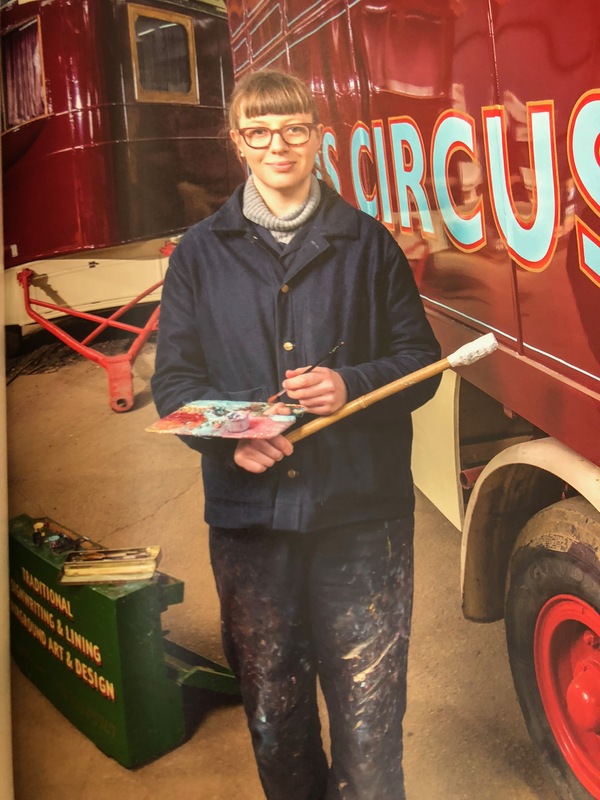 Perhaps it was inevitable that Amy Goodwin is now a signwriter and fairground artist as she spent most summers in her youth travelling as part of a steam fairground. She trained with one of the best and, traditionally, uses no guidelines, tape, or computers – it’s all done by hand. Amy is now mid-way through a practice-based PhD focusing on five women in fairgrounds. 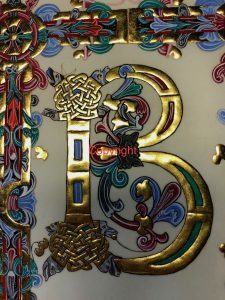 This glorious book is lavishly illustrated, beautifully photographed, with detailed text on many of the QEST scholars and apprentices, showing the variety of backgrounds and experiences and the paths these wonderful craftspeople have taken. 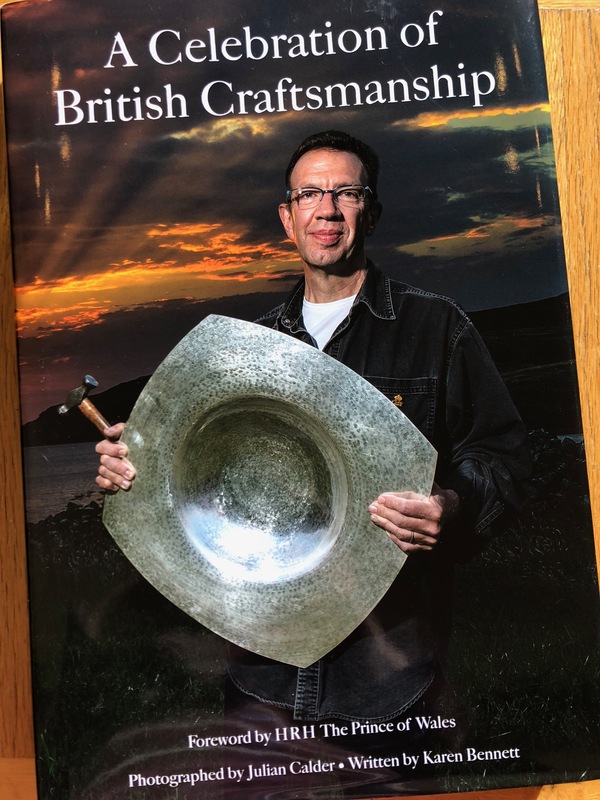 It is an ideal book for anyone interested in heritage crafts as well as for those tricky-to-buy-for people. You can buy it here. 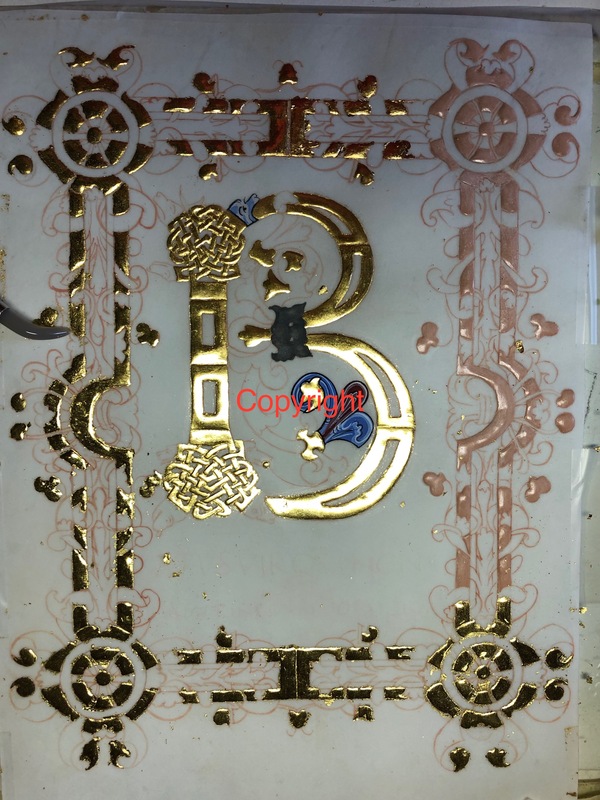 This entry was posted in Blog, Craft, Uncategorized and tagged A celebration os British Craftsmanship, QEST, Queen Elizabeth Scholarship Trust on 15 November 2018 by Patricia. 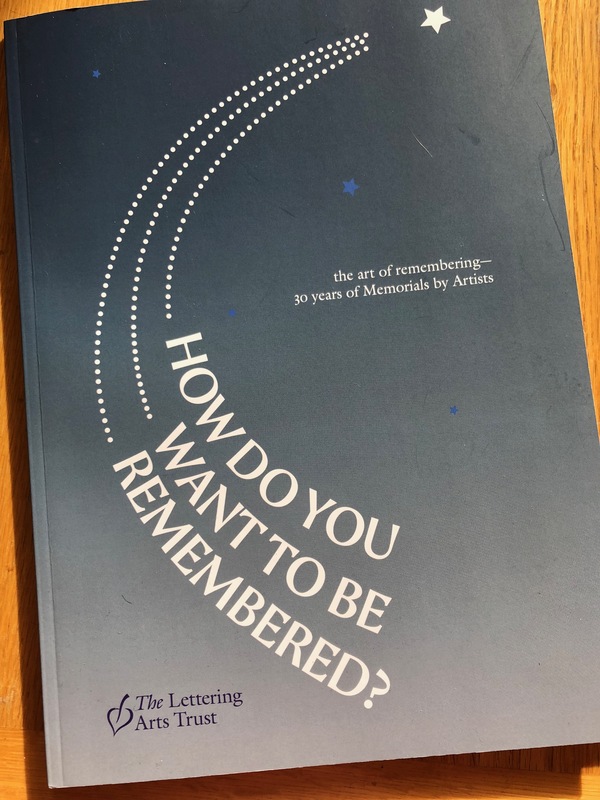 Thirty years ago Harriet Frazer MBE set up Memorials by Artists – now the Lettering Arts Trust, of which I am a proud patron. Harriet had had problems finding just the right headstone for her step-daughter who had died young. 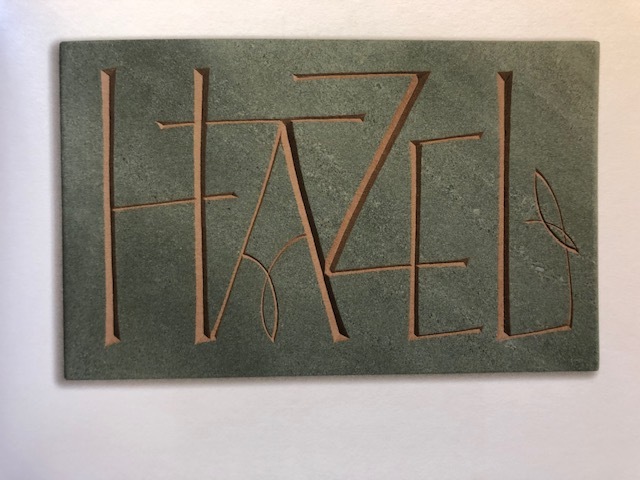 Not wanting the usual impersonal polished granite, with machine-made letters, Harriet found it difficult to locate someone who could produce what she wanted. 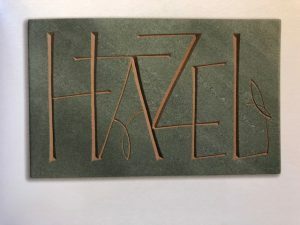 To help others who might be having similar problems, Harriet decided to set up the charity, putting those wanting a memorial in touch with the best craftsperson who could fulfil that. But first, she needed to have some sort of identification – a branding or logo. Here are various lettering artists’ interpretations of the first name for the charity. On the top right, and what was chosen, is a wood engraving by Michael Renton, and below that the outline design by Tom Perkins. 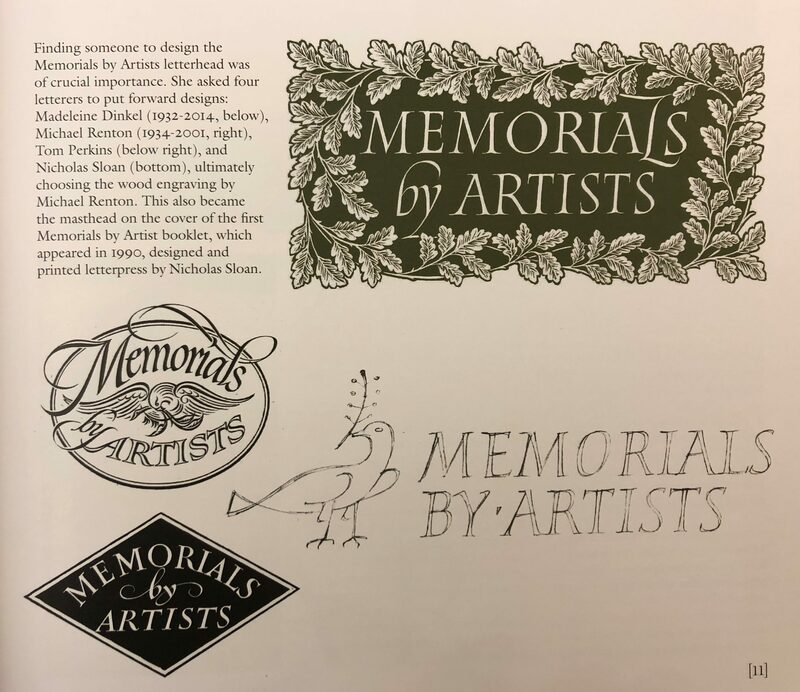 Nicholas Sloan’s design, bottom left, was lozenge-shaped, and Madeleine Dinkel’s design has exuberant flourishes and incorporates the dove of peace. 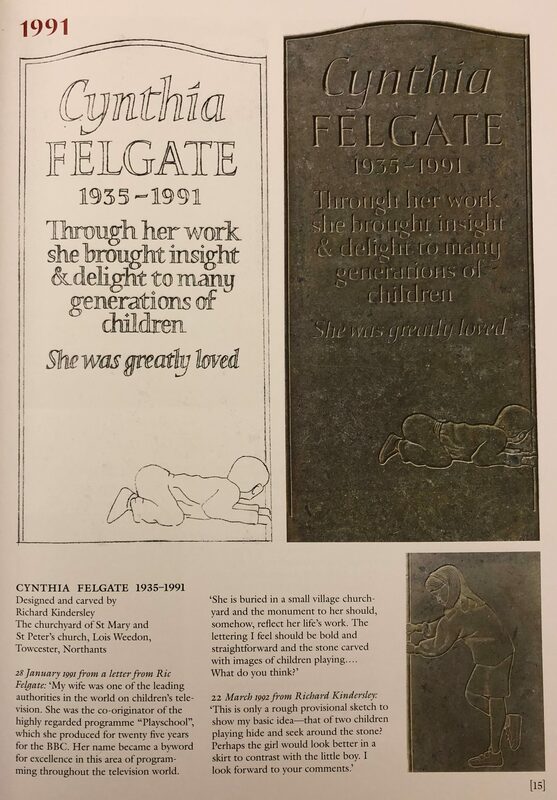 The potential individuality of each design, as opposed to a standard headstone, is shown here in this stone for Cynthia Felgate who was the co-originator of BBC’s Playschool and was one of the leading authorities on children’s television. Richard Kinderley’s design delightfully has two children playing hide-and-seek around the stone. 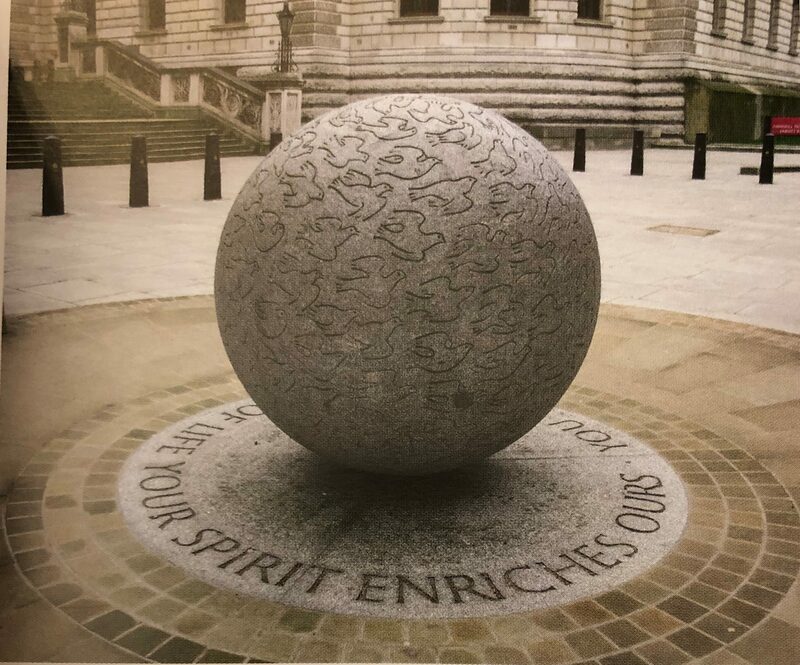 The charity doesn’t just focus on individual memorials as is shown by the Bali Bomb Memorial at the foot of the Clive Steps in Horseguards Road in London. 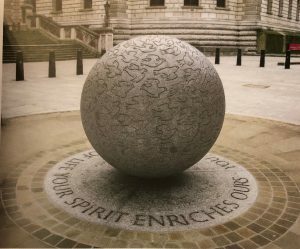 Gary Breeze and Martin Cook both worked on this inspired design which consists of a large stone globe carved with 202 doves, each one different, representing the individuality of each person killed in the incident. 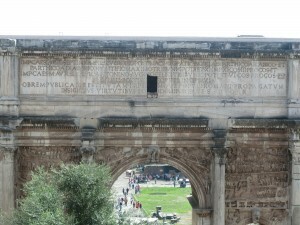 Names were carved into a curved wall, with stone seats. 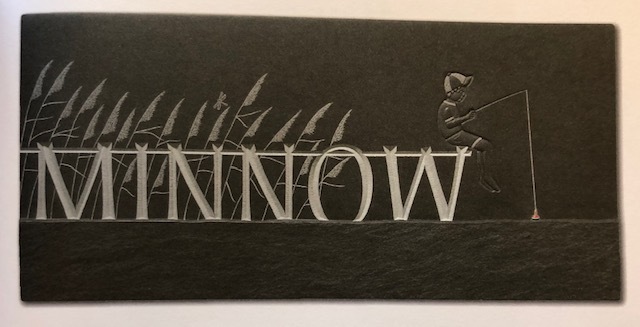 And to show what a difference lettering style, shapes and decoration can make, Nicholas Sloan carved three different memorials for his mother. 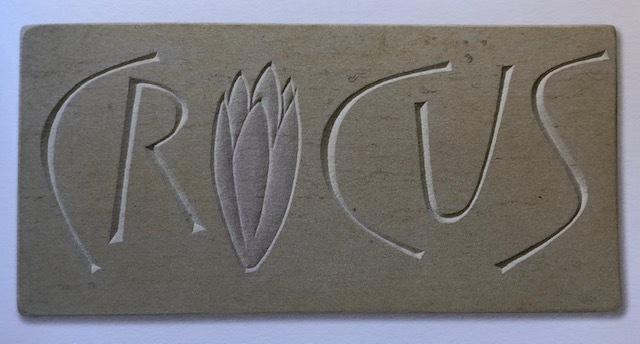 Each one reflects a different aspect of her character, a formal design cut into slate, then one which is more casual with an uneven edge, and lastly one which shows the interest in gardening and bee keeping. 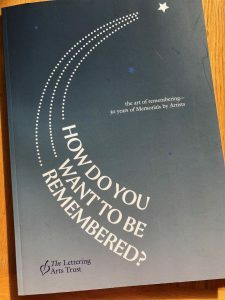 The 30th Anniversary is being marked by an exhibition that finished this Sunday, and also by a book which can be bought here. 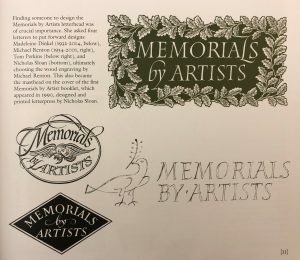 This entry was posted in Blog, Calligraphy and lettering and tagged How do you Want to be Remembered, letter cutting, Lettering Arts Trust, Memorials by Artists on 15 November 2018 by Patricia. Lettering at the base of Trajan’s Column at one end of Trajan’s Forum in Rome is regarded by many as one of the best example of Roman Capitals. 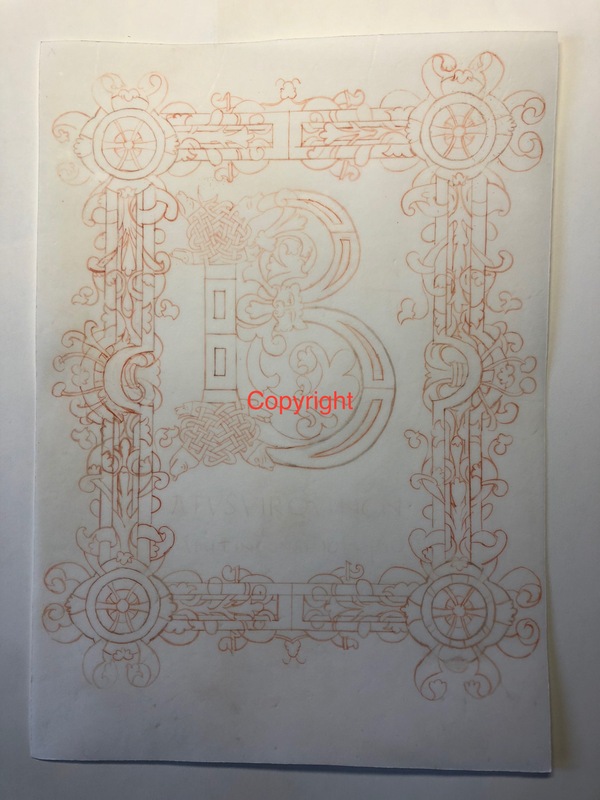 These majestical letters, with beautiful proportions, are one of the purest guides for any who want to study the proportions of Roman Capitals. 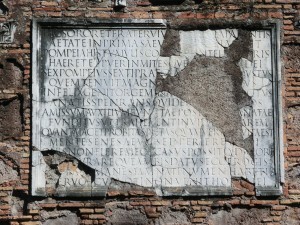 On a recent trip to Rome, I was determined to take the best photograph I could of this block of lettering. For many years this Forum was closed for restoration (it is the other side of the road to the main Forum), but I had read that Trajan’s Forum was now open and so I could stand in front of the column and get a good shot. Good fortune was clearly not smiling on me, as when we were there it was closed yet again, with no date for re-opening, and this was the best photograph of the lettering I was able to get – not what I had planned at all, and only from a side angle. 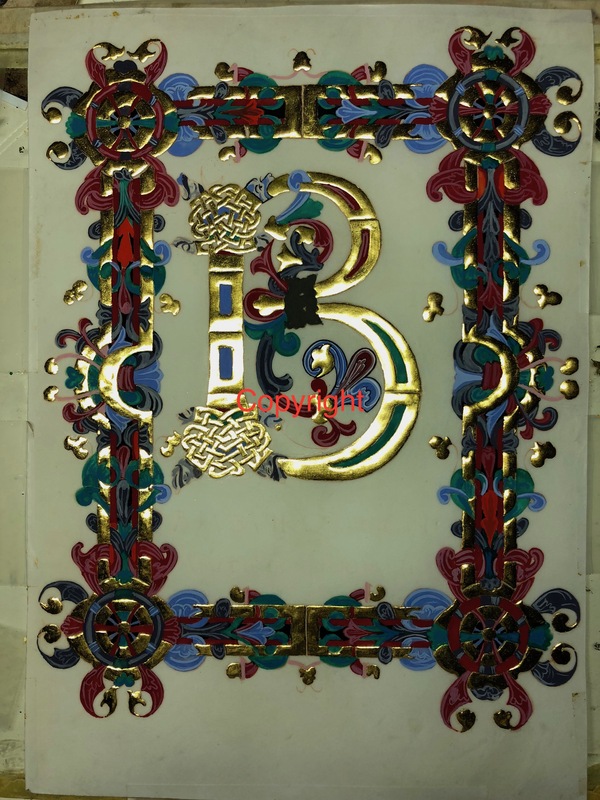 The letters are not narrow as they look here, but grand and rounded. 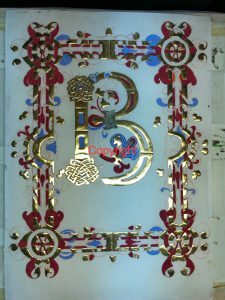 Notice also the way in which a later roof for a porch of an access door has been cut into the last line of the lettering. 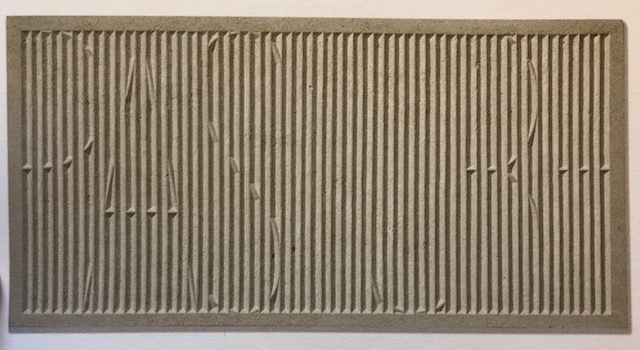 Interestingly, which you may just be able to make out here, the height of the letters on the top line is greater than the next, and so on until the bottom line. 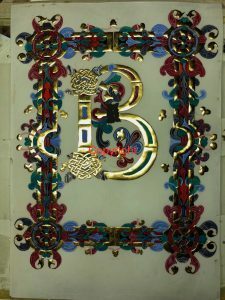 This is because the letters were designed to be viewed from the ground, and by having larger letters at the top, they would look all the same. 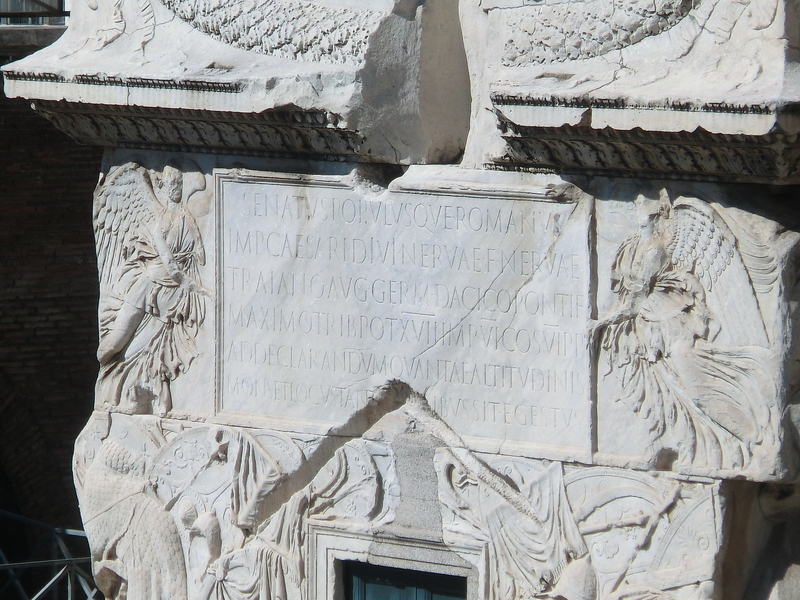 There are examples of stunning Roman Capitals all over Rome (including all the modern street names). 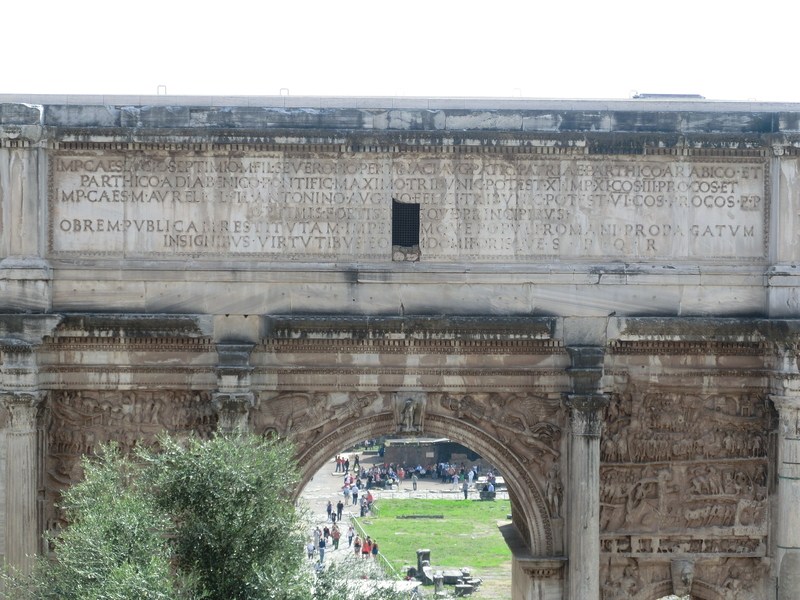 This is the triumphal Arch of Septimius, just across the road from Trajan’s Forum in the main Forum. It is best viewed, as here, by not going into the Forum itself, but climbing up the path behind the Vittorio Emmanuel monument. 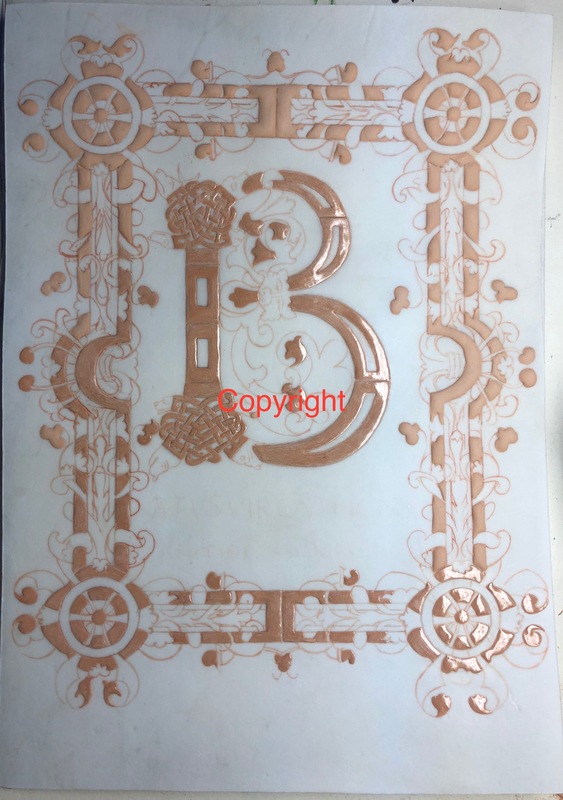 The letters were originally bronze and you can make out in close-up the small round darker areas which indicate the attaching pins. 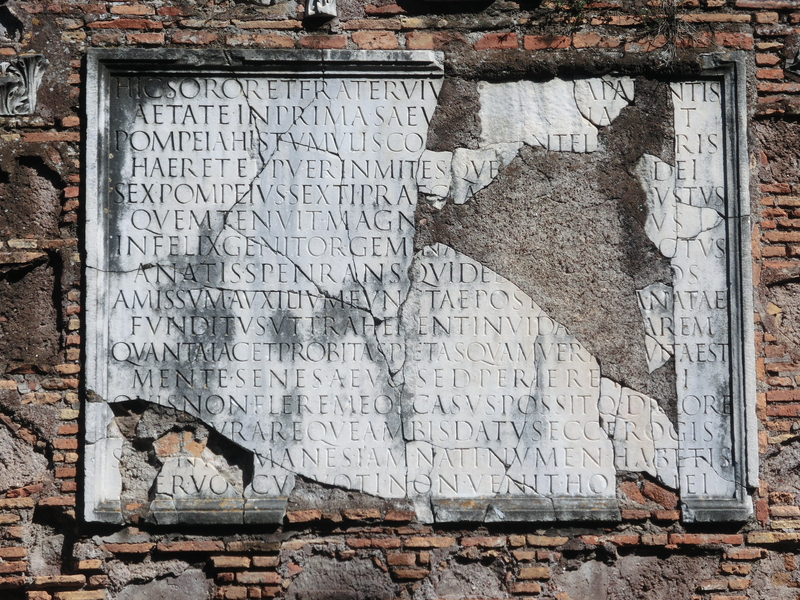 Undaunted by inaccessibility to Trajan’s Column, I knew that there were really good examples of Roman lettering attached to the tombs along the Via Appia, some way out of the city centre and a long walk, but certainly worth a visit. This is just one example. 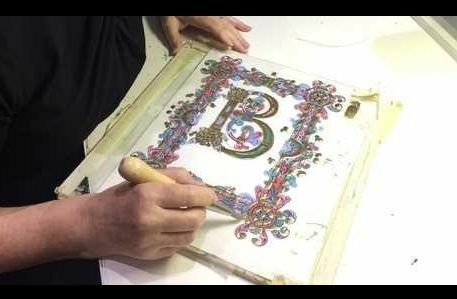 The letters are beautifully cut in marble, and generally their proportions are good – although the letter N is rather too wide in most examples. 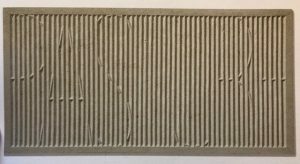 However, spacing is not always as good as the letter-forms, lines 9 and 11 being examples of letters pushed too tightly together. 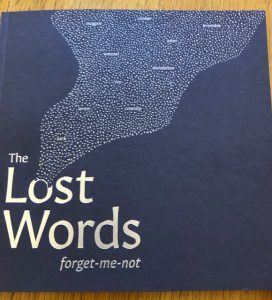 David Kindersley, the great letter-cutter, used to say that a bad space is worse than a bad letter. 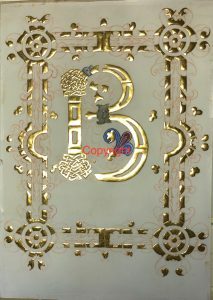 See my Calligraphy Clips on spacing. 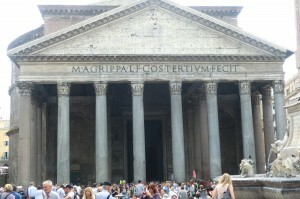 The Pantheon, the temple to all gods, has some majestical Roman lettering along the top of it. 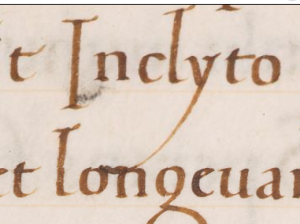 From this you can see how wonderfully clear the letter-forms are. 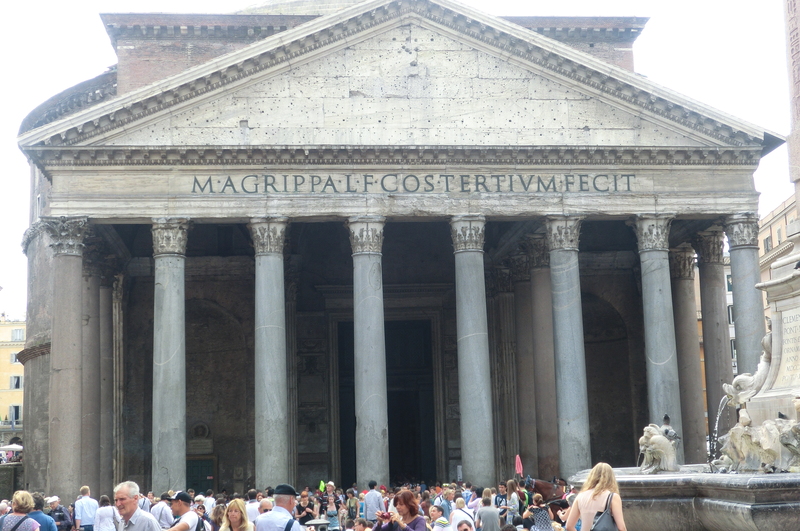 We were standing quite a long way away yet it is clear that Agrippa was involved and it was made (FECIT)! 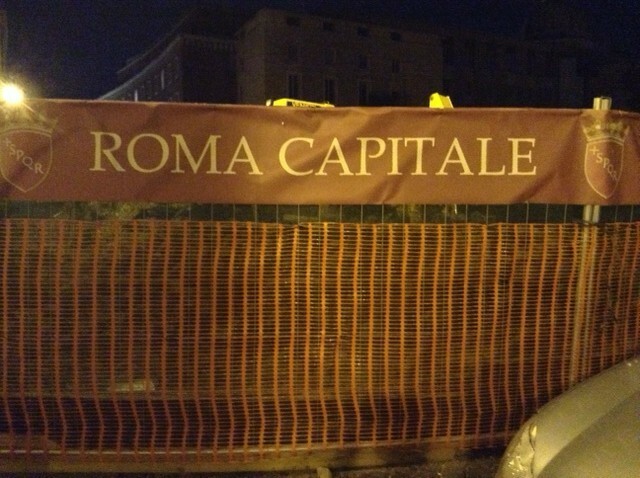 Even road signs around building sites look good in Rome when Roman Capitals are used, but if we’re also looking at spacing, slightly blur your eyes. The ROM is fine, but perhaps the letter ‘A’ is slightly too far to the right. It is the ‘PIT’, though, in the middle of ‘Capitale’ which really stands out. The letters ‘I’ and ‘T’ need to be further to the right, and join up more with ‘ALE’. 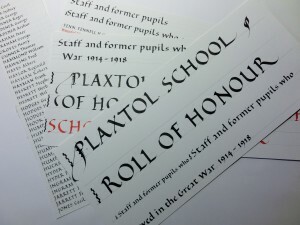 But this is being really picky when such a good use is made of this wonderful lettering style. 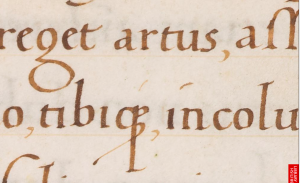 So what are the proportions for Roman Capitals shown in all these examples? 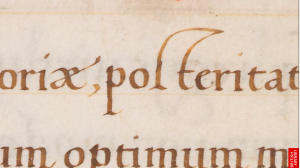 Allowing for the fact that letters need to breath, and don’t always conform, generally speaking the letters in Roman Capitals are regarded as being based on a circle that can be encased within a square, as shown here. 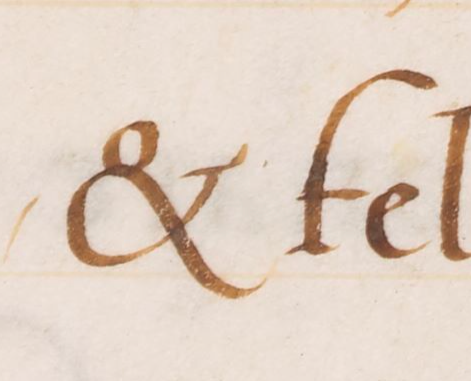 Obviously the letter O is that circle, and Q too with its tail (notice it poking out to the right). 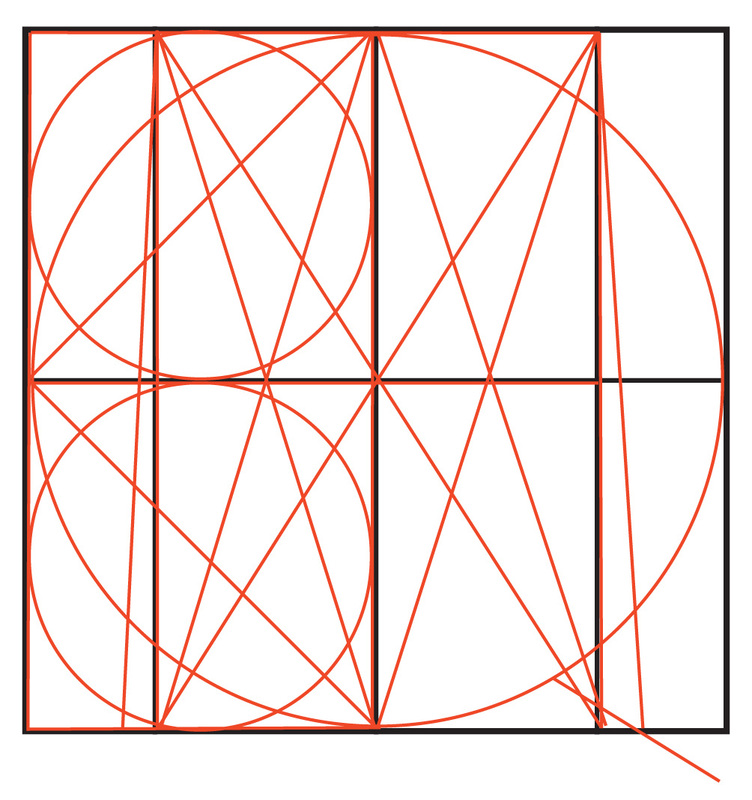 The letters C, D, and G are also formed from parts of that circle. You can trace them with your finger over the red lines. 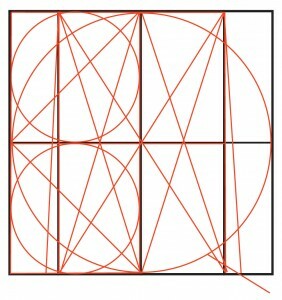 Asymmetrical letters, then, are narrower, and the width of half of a square, as shown on the left of the diagram. 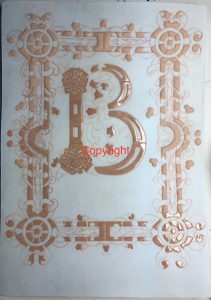 These are B, E, F, J, K, L, P, R and S.
The odds are the letters I and W. Obviously the letter I is a vertical line. 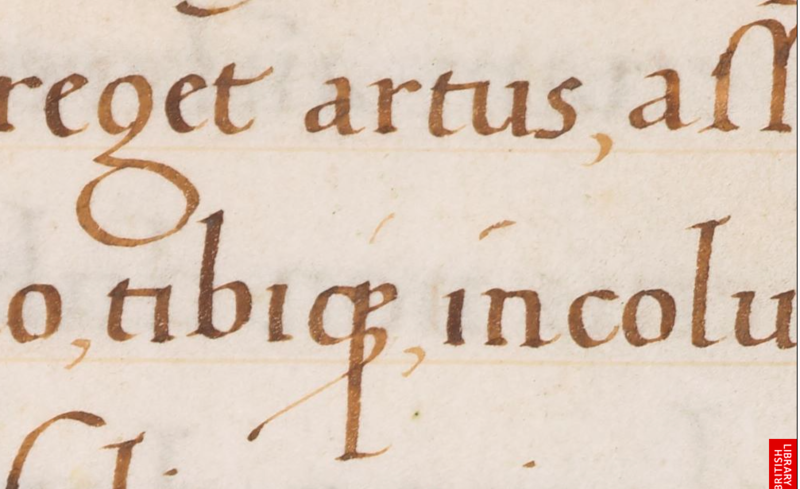 The Romans, very sensibly, had nothing to do with the letter W and it is an awkward letter. 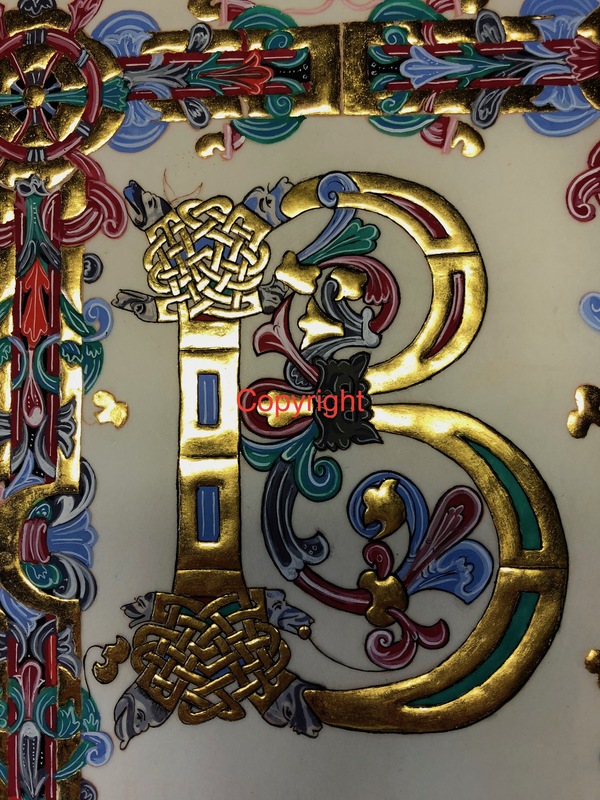 Nowadays it is regarded as two very slightly narrower Vs.
To see how Roman Capitals can be made to sing, look at this wonderful example of lettering from Tom Perkins for the Heritage Crafts Awards. 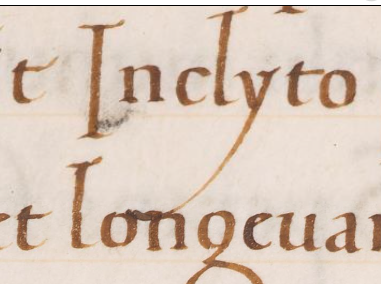 THIS is how Roman Capitals should look when they are made into a distinctive personal style. 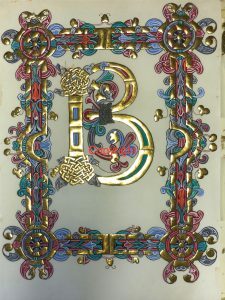 But lettering should not have a rigid a straight jacket, but room to allow it to breath, so the letter R has a tail that sensibly extends beyond that half a square and the top bowl is larger than that of the letter P, the top and bottom bowls of the letters S and B are not equal in size, and so on. 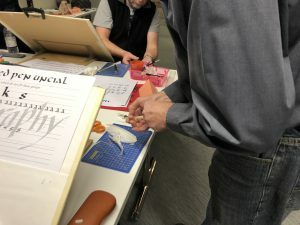 Studying the proportions of Roman Capitals is a good first step, but keeping rigidly to them is not the best second step! 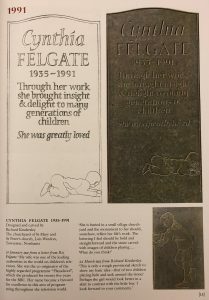 This entry was posted in Blog, Historical building and buildings, Interesting stuff and tagged Arch of Septimus, David Kindersley, Heritage Crafts Awards, Pantheon, Roman Lettering, Rome, Tom Perkins, Trajan's Column on 22 October 2018 by Patricia. 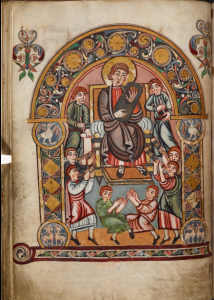 The Lindisfarne Gospels, the St Cuthbert Gospel, the Book of Durrow, the Alfred Jewel, the Vespasian Psalter, Beowulf, items from the Staffordshire Hoard, the Domesday Book, these and many other gems are all there in the Anglo-Saxon Kingdoms exhibition at the British Library, from October 2018 to February 2019. 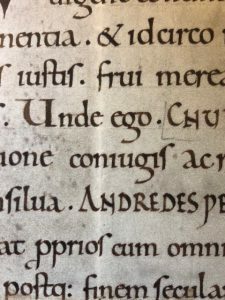 It is an astonishing array of manuscripts and artefacts, and some, like the great bible that Abbot Ceolfrid at Monkwearmouth (Sunderland) had loaded on to his boat by two men to take to present to the pope on 16th June 716, have not been on show in the UK for centuries (and in the case of the Ceolfrid Bible – not since 716!). 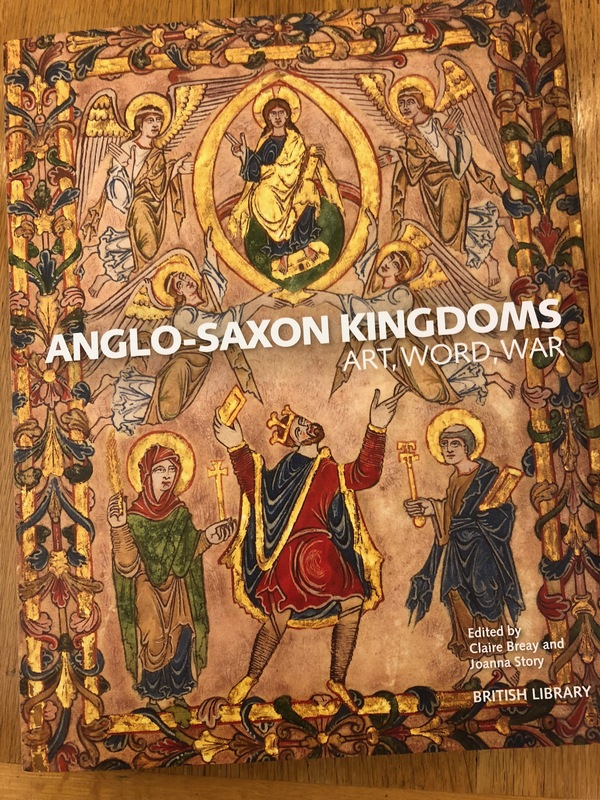 The accompanying catalogue (see above) is packed with details of each exhibit, every one of which is photographed beautifully, and there is also fascinating background information in a series of essays, which include Anglo-Saxon England and the Continent (Joanna Story), Language, Learning and Literature (Andy Orchard), Interactions with Ireland (Bernard Meehan), The Emergence of a Kingdom of England (Simon Keynes) and Conquests and Continuities (Julia Crick). 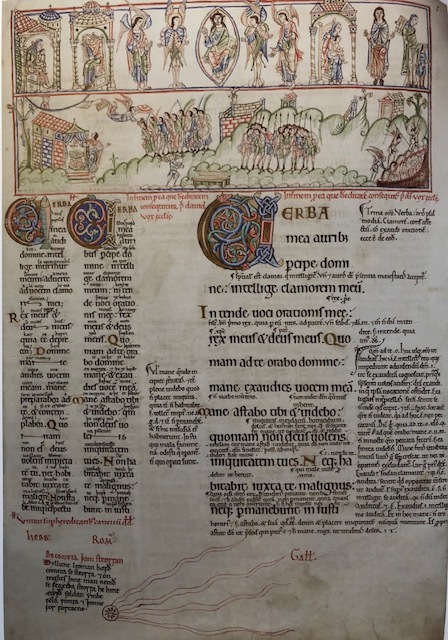 Each of these essays is lavishly illustrated with many full-page illustrations of manuscripts, including that of the comet drawn at the bottom of the page of the Eadwine Psalter shown here, heralding, according to many at the time, impending significant events – as in the conquest of England. An early manuscript in the exhibition is the earliest copy of the Rule of St Benedict. 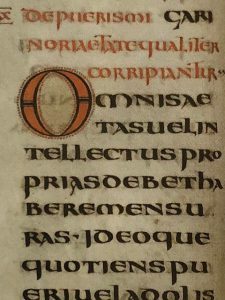 Made in England around 700 AD it shows a very ‘pure’ (in my opinion) form of Uncial script with larger initials written in red, outlined in black and with a black horizontal ornamental line, and surrounded by red dots made with a quill. 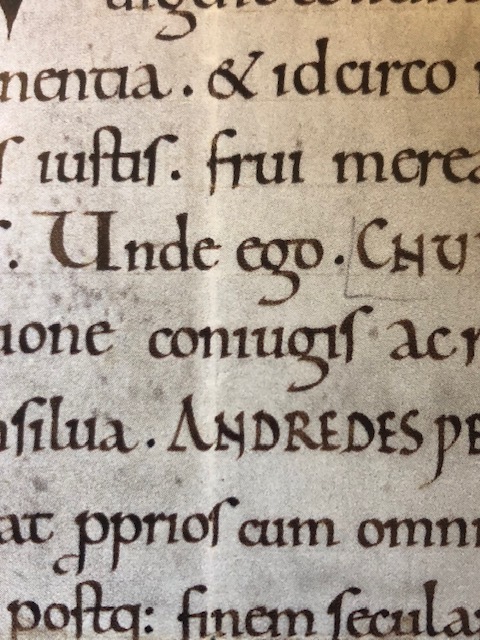 This form of Uncial incorporates many pen nib angle changes and so would have been slow to write. For the letter N, for example, the pen nib angle is changed to 90° to the horizontal guideline for the first vertical stroke, the base triangular serif is then constructed with the left-hand corner of the nib, a change of pen nib angle to 0° for the narrow top serif and that thicker diagonal stroke, and then back to 90° for the second vertical stroke and again a constructed serif. Try it yourself and see how much longer this is than when you write a simple majuscule N! And what real gems there are here! 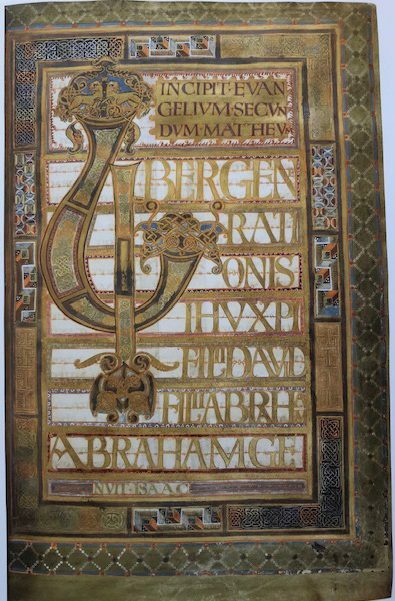 This magnificent page from the Harley Golden Gospels, so well named, is a riot of gold, pattern and colour. 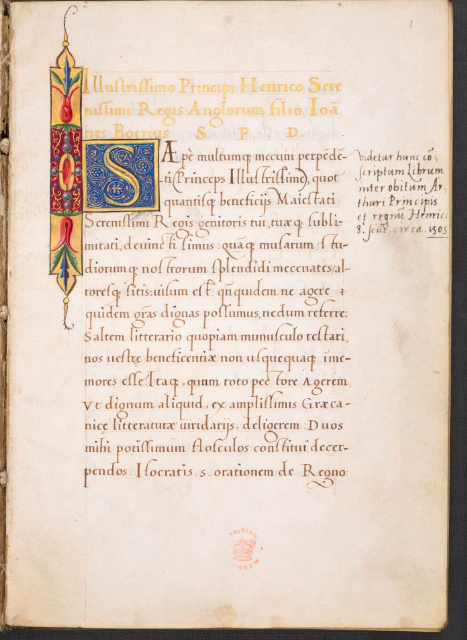 There is, as would be expected in a manuscript of this period (first quarter of the ninth century), interlace, but also a type of Greek key design, an intriguing pattern of semi-circles and white dots in triangles, but what caught my eye was the pattern half way down the right and left borders. 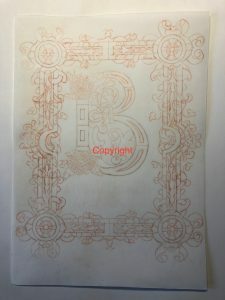 This angular design, outlined in white, shows an understanding of perspective not always evident at this time. 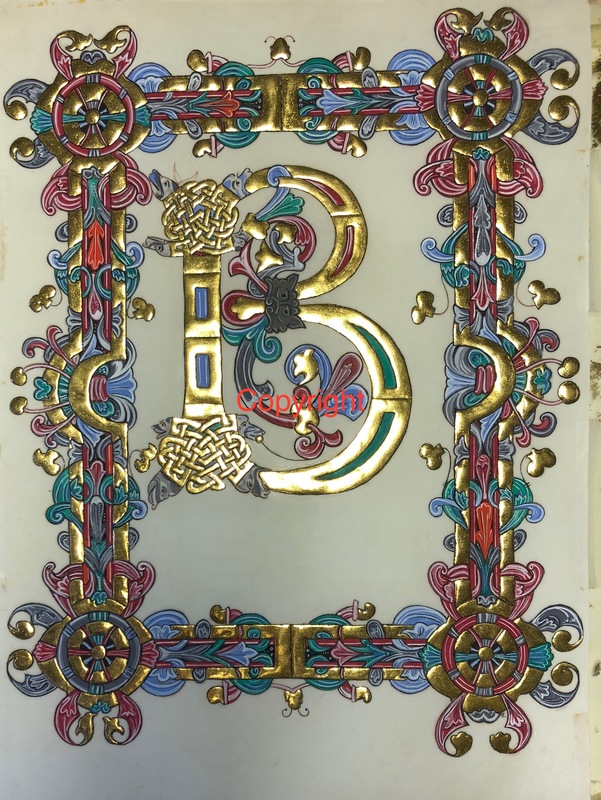 The two doe-eyed golden lions on a rich blue background, have their feet trapped in interlace – no wonder their tongues are sticking out in frustration! Having copied out the David as Psalmist page from the Vespasian Psalter, the horns blown by the musicians to the sides of the main image are fascinating, not least because only one of the four looks happy in playing their music! How amazing, though, that an example of those very instruments, the River Erne Horn, is on display as part of this exhibition. 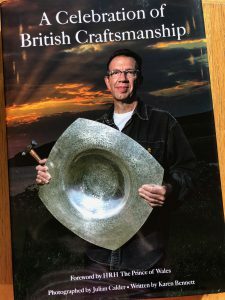 The wooden horn was made by splitting the yew wood into two, hollowing out the middle, and then sticking it back together again, reinforcing the join with bronze hoops. 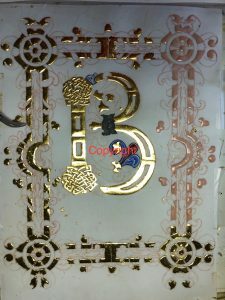 There is also a bronze mouthpiece, with the metal bent back to make a rim for the player’s mouth. 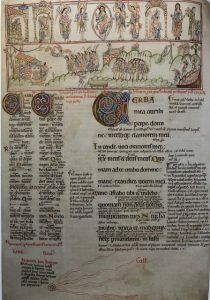 The Tiberius Psalter was made in Winchester in the second or third quarter of the 11th century, and has a series of prefatory drawings in the typical lively outline and coloured wash of that time. The incredible imagination of the artist is shown in this enlargement of St Michael (in this instance) and the dragon. 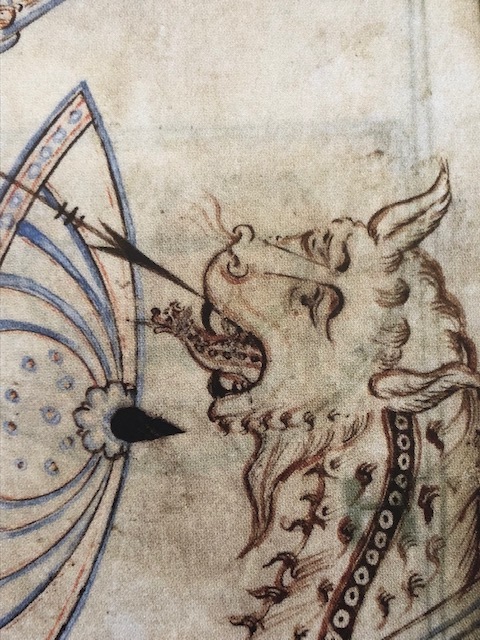 The saint is poking his spear at a rather benign animal sitting on his haunches with a wonderfully curling tail, a slight snort coming from his nostrils, and a cheeky little animal representing his tongue, also about to attack the saint, and also with another tongue poking out of his mouth. 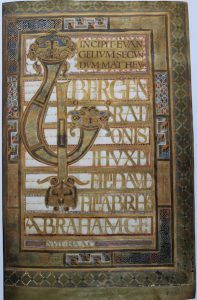 This exhibition is a once in a lifetime opportunity to see in one place a whole range of significant manuscripts and artefacts. 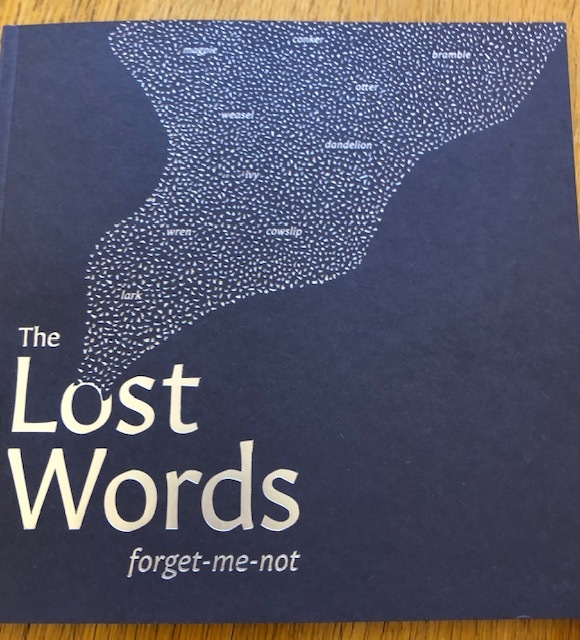 It really is a ‘must-see’, but if that isn’t possible, then the exhibition catalogue, with its essays, fabulous images and detailed information about each exhibit comes a good second. 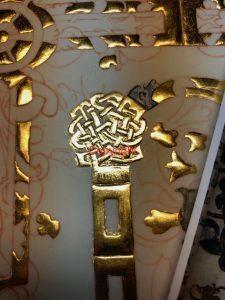 This entry was posted in Blog, Calligraphy and lettering, Exhibitions, Manuscripts and tagged Alfred Jewel, Anglo-Saxon Kingdoms, Beowulf, Book of Durrow, British Library, Charter of King Cnut, Codex Amiatinus, Domesday Book, exhibition, Harley Golden Gospels, Lindisfarne Gospels, manuscripts, River Erne Horn, St Cuthbert Gospel, Tiberius Psalter, Vespasian Psalter on 15 October 2018 by Patricia.